This paper examines the Buddhist ritual Wesak -- commemoration of the birth, enlightenment, and death (or parinibbāna) of the Buddha -- and its social function in creating Buddhist identity. A socio-historical survey of early Wesak rituals and case studies of Sri Lanka and North America provide examples of the development of Wesak as a ritual. This socio-political interpretation of Wesak reflects the consolidating nature of ritual through its interactions with other political and religious systems, and offers a glimpse into the emerging ecumenical form of Buddhism in North America. Dans cette thése, nous examinons le rituel bouddhiste du Wesak – commémoration de la naissance, de l' édification et de la mort (ou parinibbāna) du Bouddha - et son rôle social dans la création de 1 'identité bouddhiste. Une analyse socio-historique des premiers rituels du Wesak et des études de cas du Sri Lanka et de l' Amérique du Nord fournissent des exemples de l' évolution du Wesak en tant que rituel. Cette interprétation socio-politique du Wesak révèle la nature consolidante des interactions que le rituel permet d'entretenir avec d'autres systemès politiques et religieux et donne un aperçu de la forme oecuménique du bouddhisme en Amerique du Nord. 2.1 Wesak in Asia: "Public" and "Closed"
6.3.4 CYM Day: "The White Wesak"
The ritual celebration, Wesak (sometimes also rendered Vesak, or Visakha), commemorates the birth, enlightenment, and death (or parinibbāna) of the Buddha.1 This lunar ritual, whose name is derived from the second month in the Indian calendar, Vaiśākha, is celebrated on the full moon of the fifth lunar month (usually May according to the Gregorian calendar). Although Wesak is technically defined as a Theravāda ritual, in this paper it will become evident that Wesak also denotes a wider variety of ritual expressions within Buddhism. This thesis examines the role of Wesak in the creation of Buddhist identity in Southeast Asia and North America. More specifically, I will identify the impact of western political ideals on Wesak rituals in Sri Lanka, a traditionally Buddhist country, and in North America. The effect of western secularism and pluralism on shaping a sense of collective Buddhist identity has resulted in a more ecumenical form of the Buddhist tradition. Concomitantly, since in the case of both Sri Lanka and North America, Buddhism is a minority religion, the Wesak ritual acquires socio-political power, not only for the individual Buddhist communities who host the event, but also for the larger Buddhist cultural and ethnic communities, within which these groups reside. Thus, this portrait of Wesak will reflect how politics, religious belief, and ethnic culture interact within a ritual such that group cohesiveness and social order, within the Buddhist communities in Sri Lanka and North America, are consolidated. In the introductory chapter, I will define the topic and explain the meaning of the term Wesak, the nature of the ritual, and describe its various manifestations in Southeast Asia, North America and around the world. Chapter One focuses on the methodology used throughout the thesis. I define the term "identity", explicate the functionalist framework used, and review the literature pertaining to this research. Chapter Two emphasizes the different characteristics of the variety of Wesak rituals found around the world. Chapter Three, using examples culled from traditionally Buddhist Southeast Asian countries, highlights the syncretic nature of Wesak's development as a ritual. After this, Chapter Four offers a more specific case study of Sri Lanka where encounters between Sinhalese Buddhists and western culture have significantly affected the nature of Sinhalese Buddhist identity. In Chapter Five, the focus shifts from Southeast Asia to the history and dynamics of Wesak in North America. Wesak has been an important part of the Buddhist struggle to be recognized as a legitimate presence in many cities across North America. Chapter Six deals with the various North American adaptations that have occurred in the ritual content of Wesak itself and within the larger framework of the Buddhist tradition as well. It is shown that through adaptation and incorporation of western values a collective Buddhist identity has started to emerge. Wesak also functions as a catalyst for the creation of pan-Buddhist2 groups as a means of consolidating Buddhist identity in the face of minority status. The Buddhist Council of the Midwest, situated in Chicago, and the Buddhist Communities of Greater Toronto, are examples of such groups. A brief historical survey will preface my evaluation of the concurrent appearance of the Wesak festival and pan-Buddhist groups within North America. By tracing the development of Wesak as a historical construct, the social function of this ritual to create and affirm identity will be ascertained. In the cases of Sri Lanka and North America, Wesak has provided a sense of continuity through its annual celebration. Wesak has also provided a means of transformation within the Buddhist tradition, by consolidating a distinctly Buddhist identity through its imitation of the "Western Other" and its ideals such as secularism and pluralism. It is through this process of imitating the Other that an ecumenical form of Buddhism has emerged in North America. It is through the process of identifying things that we come to understand the world we live in. Derived from the Latin root, idem, the word “identity”, meaning “the same”, actually has two meanings. The first, as the Latin root indicates, refers to the idea of “absolute sameness”. The second definition, cited in Peter Jenkin’s book, Social Identity, “is a concept of distinctiveness which presumes consistency or continuity over time” (Jenkins 3), which immediately establishes the dynamic of “insider” and “outsider”, or “us” and “other”. While a collective identity consists of similarities, it also requires the exclusion of others. Discussion about identity can be meaningful only if there exists an “Other”. Thus, it is only through difference that group identity is consolidated or reaffirmed. This us-other dynamic has affected, and is reflected in, the changing form of content of Wesak rituals. Ironically, the development of Wesak celebrations in both Sri Lanka and North America would indicate that the cardinal mode of identity creation for buddhists is imitation and incorporation of other’s ritual traditions. For buddhists in Sri Lanka the Other is historically represented by the christian colonialists and for those in North America, the Other is embodied in western socializing forces such as individualism and secularism. In both cases, the respective Buddhist communities have had to adapt to potential threats to their collective identities. Buddhist identity becomes an issue precisely because of this cultural contact, or confrontation, involving divergent languages, cultures, religions, festivals, etc. Thus Wesak becomes a central ritual medium through which communication takes place between Buddhists and the Other. In this paper, I am not concerned with defining personal Buddhist identity, since such endeavors are highly subjective, and seem to be derived from a collectively shared sense of identity in the first place. Defining Buddhist identity in general is already problematic given that there are a large number of sub-classifications involving Buddhists who define themselves in relation to other kinds of Buddhists, e.g., "ethnic" vs. "occidental", or "Theravāda" vs. "Mahāyāna ", etc. Therefore, throughout this paper Buddhist identity is assumed to be synonymous with social identity. It should also be emphasized that identity is a dynamic; as Jenkins points out, "identity can in fact only be understood as process; as 'being' or 'becoming'" (Jenkins 4). Identity is often referred to as something that “Just is" -- a social phenomenon that is final or static. Jenkins cautions against this approach, and emphasizes understanding personal and collective identity in terms of a working process that revolves around social interaction. This inevitably involves "doing things, i.e. social activity, process and practice, together in inter-related and institutionalized ways" (Jenkins 139). The adaptations to the Wesak ritual that have occurred in Sri Lanka and North America reflect this kind of social activity. The inclusion of Christian elements in the Sinhalese Wesak celebrations, and the creation of pan-Buddhist groups that exist to organize Wesak celebrations in North America, are examples of the dynamic interplay between constantly changing political forces and the meaning derived from ritual. Annual Wesak celebrations provide Buddhists with an opportunity to assemble and to identify not only with each other but also with the entire Buddhist tradition. Continuity is maintained through commemoration of the figure and message of the Buddha, and yet transformation occurs due to the convergence of different cultures, languages, belief systems, etc. Tracing the historical development of Wesak in Southeast Asia and its more recent introduction to North America identifies certain elements that provide a sense of continuity for the Buddhist tradition, and those elements transform it. This perennial tension between tradition and interpretation illustrates Jenkins' point that the continual consolidation of identity is always a dynamic. Studying the impact of western ideals on Wesak's ritual content and on identity politics reveals the process that is Buddhist identity. In this paper, the primary approach to the Wesak ritual will be a functionalist one, an approach that explains social institutions "primarily in terms of the function they perform" (Jary and Jary 183). I have chosen a functionalist approach to study Wesak since this form of explanation describes Wesak in terms of its "continuing contribution to the working and persistence of the society in question" (Jary and Jary 516). In this context, the society in question is the Buddhist tradition. In order to determine Wesak's continuing role as a consolidator of Buddhist identity, it is necessary to adopt a sociological approach that takes into account the origin and continuation of religion in terms of its contribution to the maintenance of social solidarity. Alternative approaches, such as symbolic interactionism and conflict theory, while popular methods of social analysis, do not specifically address the positive effects that a ritual like Wesak might have on the Buddhist tradition. Therefore, this functionalist approach to Wesak celebrations highlights Wesak's role in consolidating a sense of Buddhist identity, while acknowledging the two-way relationship between ritual and identity. More precisely, emphasis will be placed upon the consolidation of a distinctly Buddhist identity against the Other through imitation of that Other. The sociological dimensions of this paper are rooted in the works of one of the most influential vfunctional theorists, French sociologist Emile Durkheim. In his Elementary Forms of the Religious Life, Durkheim argues that religion is primarily a way of socially organizing groups of individuals. Religion promotes social stability by presenting a set of ideas and practices that makes sacred, or sacralizes, the communal bonds that already exist within a particular community (Durkheim 36-42). From a functionalist perspective, ritual is essential in fostering social solidarity. Durkheim views the efficacy of ritual ''as the means by which individuals are brought together as a collective group" (Bell 25). More importantly, ritual occasions such as Wesak function to "strengthen the bonds attaching the individual to the society of which he is a member" (Durkheim 36). The annual commemoration of the Buddha, as manifested through various forms of Wesak rituals around the world, provides Buddhists with a way to express their social interdependence and provides a ritual locus of group identity. Essentially, the function of Wesak celebrations is to provide a sense of continuity for Buddhists, not only through veneration of the Buddha, his teachings, and the community of disciples, but also through the historical tradition of celebrating Wesak itself. It is through the annual celebration of Wesak that "the rhythm of collective activities" is maintained; "its function is to assure their regularity" (Durkheim 11). My portrait of Wesak as a source of identity consolidation agrees with David Kertzer's proposition that "rites create political reality" (Kertzer 1). Catherine Bell defines political ritual as "those ceremonial practices that specifically construct, display and promote the power of political institutions (such as king, state, the village elders) or the political interests of distinct constituencies and subgroups" (Bell 128). Some examples of political rites are the coronation of a monarch, the American Pledge of Allegiance, the Nazi "Heil Hitler" salute, the public execution of a convict, and the cross- burnings of the Klu Klux Klan.... (Bell 129). In all of these symbolic enactments the ritual action does not simply reinforce a group's power, but actually generates power through the collective meaning such public displays are given. Descriptive information concerning the Sinhalese Wesak celebrations was obtained from two articles written by Sinhalese scholars. First, the Vesak Fullmoon Festival written by J. B. Disanayaka (published as part of a series called Introducing Sri Lankan Culture) is useful in that it conveys a sense of the festival atmosphere of contemporary Wesak festivities in Sri Lanka. Disanayaka also documents various innovations in the Wesak ritual such as Buddhist dancing, painting, and dramatic reenactments. This work, however, is biased given that it is an attempt to promote Wesak and Sinhalese Buddhism in a positive light to those not familiar with the Buddhist tradition and its ritual celebrations. The article entitled "Christian Impact on the Wesak Celebrations in Sri Lanka" by G. P. V. Somaratna is more directly relevant to the aim of this paper. Somaratna's article highlights the Buddhist appropriation of colonial missionizing techniques, i.e. Christian missionary education and festive rituals such as Christmas, as a means of initiating a Buddhist resurgence in Sri Lanka. In response to Christian missionary activities, Wesak served as a Buddhist alternative to the growing popularity of Christian ritual celebrations among the local Sinhalese population. The incorporation of Christian festive elements into the Sinhalese tradition of celebrating Wesak resulted in a shift from a closed monastically oriented ritual to a more public celebration characterized by increased lay participation. Somaratna's article, through its emphasis on the socio-political dynamics surrounding modem Sinhalese Wesak celebrations, provides valuable insight into the consolidation of Buddhist identity. Although still relatively new, scholarly study of Buddhism in North America has produced a large quantity of material examining the establishment of Buddhism in North America. One such work, The Faces of Buddhism in America (1998), contains a variety of articles exploring the transfomation of Buddhist schools through their encounter with North American society. Of particular interest are Paul Numrich's article, "Theravada Buddhism in America: Prospects for the Sangha"; Jan Nattier's "Who Is a Buddhist? Charting the Landscape of Buddhist America"; Rick Field's "Divided Dharma: White Buddhists, Ethnic Buddhists, and Racism"; and Kenneth Tanaka's "Epilogue: The Colors and Contours of American Buddhism". All of these articles elucidate the variety of issues that continue to shape the emerging form of American Buddhism. The works of the scholars Paul Numrich and Janet McLellan have provided useful ground-level socio-religious information about immigrant Buddhist communities. Numrich provides a detailed account of the Americanization6 of two Theravāda Buddhist communities in his book Old Wisdom New World (1996). Also, his article entitled "Local Buddhist Associations in North America" is indispensable as a resource for researching the expansion of pan-Buddhist organizations in North America and around the world. Janet McLellan's study of five Asian Buddhist communities in Toronto, Many Petals of the Lotus (1999), is useful for charting the cultural assimilation of these traditionally Buddhist communities in the North American context. McLellan demonstrates the challenges endemic to this process and emphasizes the transformative impact of such a transplant in terms of the recreation and consolidation of Buddhist identity. While both of these scholars chronicle the study of immigrant Asian communities that have relocated to North America from traditionally Buddhist countries, they mention Wesak only in a rather cursory fashion. The present study of Wesak's function as a source of identity consolidation for Buddhists furthers one aspect of Numrich's and McLellan's work. The problems I experienced in collecting data for this study mainly pertain to the method of data retrieval (video documentation), and the difficulties that arose in communicating with the variety of ethnic communities I encountered. Miscommunication in one form or another became quite a common occurrence in contacting various ethnic communities that celebrate Wesak.7 Since I had no acquaintances at the temples, nor spoke the language of the communities, I was an outsider, a definitive other. As such, my first undertaking was to find a contact person who spoke English well enough to communicate effectively with me. Despite my best efforts, however, obtaining information as basic as the time and date of the Wesak celebration and directions to the ritual site was no easy task. I am still not certain whether this lack of effective communication was simply an issue of language or if it had more to do with my status as an outsider. This socio-political interpretation of the Wesak ritual addresses the issue of Buddhist identity as an active process. As Jenkins points out, this process most often involves the interaction between one or more groups. In the context of this paper, identity is determined through the interaction between the Buddhist tradition and western ideals. The celebration of Wesak functions as a medium of communication, providing the balance between traditional and interpretative notions of Buddhist identity. Kertzer's political analysis of ritual complements a functionalist approach to Buddhist identity through his proposition that "rites actually create a political reality" (Kertzer 1), since social identity is derived primarily through ritual actions such as Wesak. To emphasize the use of ritual as a dynamic source of identity creation, not only in North America but also in Southeast Asia, it is helpful to provide some background information in the form of some examples of Wesak celebrations that reveal the syncretic nature of ritual. While ritual may intrinsically resonate with a conservative bias, it has been associated historically with syncretic blending and symbolic expropriation; both socio-cultural processes, which reflect a variety of different practices, are involved in creating a collective Buddhist identity. The following examples of different Wesak celebrations also reveal the idiosyncratic features of identity consolidation through ritual. For example, in many areas of Southeast Asia, Wesak festivities are combined with local agricultural rites such as the rocket festival (Boun Bang Fai) in Northeastern Thailand. In North America many Buddhist groups collaborate to organize multi-denominational Wesak celebrations, blending previously divergent cultural and ritual traditions. Now, many Buddhist groups co-existing in one region collaborate to celebrate Wesak. Chicago and Montreal are two cities that are home to a diverse Buddhist population and that organized a pan-Buddhist Wesak in 2000. The result is a Buddhist ritual that is increasingly defined by its ecumenical nature. There is a trend throughout the variety of Wesak celebrations around the world towards more public celebrations, as opposed to the more closed monastically oriented rituals. Traditionally, Wesak celebrations in Theravāda countries in Southeast Asia, namely, Sri Lanka, Myanmar, Thailand, Cambodia, Laos, and some parts of Vietnam and Malaysia, tended to revolve around the local temple or monastery (Swearer 1987, 548); significantly the latter served as the center of religious and cultural activity within Buddhist communities. In Southeast Asia Wesak tended to be a closed ritual event for ordained Buddhists, observed primarily by monks who performed a simple ritual service in commemoration of the Buddha. Lay participation was limited to a visit to the temple or monastery, in order to reaffirm their commitment to the Buddhist tradition through the observance of the Five Precepts9, and taking refuge in the Triple Gem (Buddha-Dhamma- Sangha)lO. Lay devotees might also have participated in some form of meditation, or listened to a dhamma talk. These monastically based activities indicate the closed nature of early Wesak rituals. But in Sri Lanka, in 1885, Wesak was declared an official holiday and today public celebrations, mimicking traditional Christian practices during the Christmas season, now include putting up Wesak decorations, roadside dramas re-enacting the Buddha's life story, and sending Wesak cards to friends and family. Sri Lanka is a good example of this shift from earlier closed rituals to the more public contemporary Wesak celebrations. Now contemporary Wesak rituals in Southeast Asia are public celebrations, characterized by increased lay participation. Since Buddhism's introduction to North American culture, Wesak celebrations are now held in practically every major center across Canada and the United States. Toronto, a city with more than sixty Buddhist groups (McLellan ix) has been hosting annual Wesak celebrations since 1981. The event has usually included both formal and informal components, 11 and, in its first year, a parade through Nathan Philip's Square in front of City Hall (See Appendix 1). In Chicago, the Buddhist Council of the Midwest has approximately ninety-nine group members and has been organizing a Wesak celebration every year for seventeen years. These Wesak festivities, which often last two days, similarly consist of a religious ceremony, a dramatic event, meditation instruction, and sometimes a forum for academic discussion. While traditionally held at local Buddhist temples, Wesak celebrations in North America are often held at school auditoriums, or even church halls due to the large number of lay people who attend these events. Most Wesak rituals include both a "formal" and an "informal" aspect. The formal element is generally quite highly structured and follows standardized sequences. In this sense, the formal component of Wesak might be designated a pūja, which refers to a sacred ritual event. In a Wesak ritual this usually includes a procession of monks, the making of offerings, chanting sūtras, and perhaps a dhamma talk (a sermon in Christian parlance). The bathing of the Buddha, a ritual act traditionally associated with Mahāyāna sects, is becoming a common practice within the formal component of North American pan-Buddhist Wesak celebrations. The informal component of a Wesak ritual can include a variety of elements, such as serving of food and drink, cultural performances, promotional booths, and a forum for academic discussion. This aspect of Wesak occurs sometime after the completion of the formal section, but usually on the same day. Venues like Montreal's June 2000 celebration were relatively small in size and number of participants. Thus, the informal component was limited to free food and beverages after the formal service was finished, while participants and members of the congregation casually interacted with one another. Larger Wesak celebrations, such as the one sponsored by the Buddhist Council of the Midwest (BCM) in Chicago, usually last for two days and include a cultural component consisting of a variety of different traditional ethnic performances representative of the groups that participate in the organization of the event. Although Wesak is traditionally associated with Theravāda Buddhists, it has become an international event, and in many places around the globe practitioners from a variety of different religious traditions also participate in the festivities. In addition to the annual celebrations hosted in traditional Theravāda countries, Wesak is also celebrated by Buddhists of other sects as well as by various New Age religious groups in North America, Europe, and Australia. As Buddhism has grown in size and influence throughout the world, Wesak has risen to a place of prominence within the tradition as a centerpiece for community gathering. As an ecumenical event within the North American context, it provides immigrant Buddhists with an opportunity to offer one another support in a potentially isolating environment. It encourages inter-Buddhist dialogue among various Buddhist schools that may be subject to historical divisions, as well as interaction between Buddhists and cooperation with non-Buddhists groups, primarily Christian ones. In many ways these attributes have promoted Wesak as the international celebration that unites all Buddhists under the same banner, as well as serving as the Buddhist ambassador for inter-faith dialogue. Wesak, as an increasingly popular form of ritual celebration among Buddhists, is also a political tool for the propagation of Buddhist identity. Increasingly, Wesak is mirroring the changes taking place within the larger paradigm of the Buddhist tradition, and marks the emergence of an ecumenical Buddhist identity. Evidence of this trend can be found in the United Nations resolution to make Wesak an international holiday, to be observed at United Nations headquarters and offices throughout the world. The recommendation was made at the International Buddhist Conference held in Colombo (Sri Lanka), in November 1998 (Buddhist Council of New South Wales 1), and was unanimously accepted at the 54th Meeting of the United Nations General Assembly. John De Saram, the Sri Lanka Ambassador to the United States, introduced the resolution that was sponsored by Greece, Mauritius, Norway and Turkey; co-sponsored by Lesotho, Nicaragua, and the United States; and supported by Thailand, Singapore, Bangladesh, Bhutan, Spain, Myanmar, Nepal, Pakistan and India. However, the Australian Buddhist Council of New South Wales, affiliated with the World Fellowship of Buddhists, noted on their information website that "unfortunately, Australia was silent, however they did not vote against it" (Ibid.). Wesak is a festival celebrated by people who's [sic] religion is Buddhism.The purpose of the festival is to celebrate Buddha's birthday. One thing we can tell you is that it is done in many ways. On the street they have great parades and dancers. They also pass out food to people who pass by. In the little town [sic] of Tibet or in other countries where there are Buddhists. There's [sic] lambs, crosses, moons, stars, and lots of brightly colored things. What do some really religious people do during Wesak? Well some have a long fast and some stay silent for a week! Despite the obvious attempt to draw parallels between Wesak and Christmas in order to educate young children about other cultural and religious festivals around the world, the fact that Wesak was chosen as the Buddhist representative for a Canadian school, reveals the extent of its international status. One of the main reasons for the increased visibility of the Wesak ritual in the international arena is that it condenses the complex schedule of festivals, found in all Buddhist traditions, into one ritual celebration that focuses on the key events in the life of the Buddha. The life narratives of the Buddha,12 often reenacted or recited (usually excerpts from the Mahāparinibbāna Sūtra, or the Jātaka Tales) during the course of a Wesak celebration, serve to locate a sense of Buddhist identity within a sacred and cosmic frame of reference. This mythical framework is an essential aspect of the Buddhist tradition, and provides the anchor from which all forms of Buddhist identity have arisen. The Wesak ritual, as an important vehicle for disseminating Buddhist culture, pays homage to this mythical structure through its reenactment. The variety of different manifestations of Wesak, in North America and in Southeast Asia, does not diminish its capacity for identity consolidation, but rather emphasizes the use of ritual as a dynamic source of identity creation. The syncretic blending and religio-cultural appropriation employed by Buddhists and reflected in the ritual content of Wesak around the world has enabled Buddhists to maintain some form of continuity within their tradition while adapting to a particular social climate. In fact, "It is because people create and alter rituals that they are such powerful tools of political action" (Kertzer 12). This section will begin with a brief overview of references to Wesak in early literature culled mainly from the writings of the Chinese pilgrim, Fa-Hsien, and the Sinhalese chronicle, the Mahāvamsa. Next, some examples of Indian and agricultural rites will be examined to ascertain their influences upon the development of the Wesak ritual. This socio-historical background will illuminate the syncretic nature of ritual in general and the process whereby Wesak in Sri Lanka and Toronto has come to be affected by western political ideals. Every ritual has a tradition of adaptation and modification; a ritual may change form depending on its surrounding socio-cultural context. There are many methods of, and reasons for, the modification of a ritual. In her book, Ritual Perspectives and Dimensions, Catherine Bell indicates that Buddhists used the Wesak ritual as a means of appropriating other indigenous forms of ritual practice. She states that the "appropriation of calendrical festivals already deeply ingrained in the fabric of a community seems to be very common and a highly effective strategy in places where one set of religious practices encounters and tries to dominate another set" (Bell 104). The cultural customs of the victors, including religious rites such as Wesak, then subsume those of the vanquished. A well-known example of such an appropriation is found within the Judeo-Christian tradition. The first mention of Jesus' birthday being observed on December 25 is in Rome in the year 336. This was the same day as the traditional pagan celebration of the "Birthday of the Unconquered Sun" (Natalis Solis Invicti) (Parrinder 5). The Roman calendar adapted this day of celebration to incorporate the already existing pagan festival. Since the Bible does not give a date for the birth of the Christian savior, it was not celebrated before 336. This day is now known throughout the world as Christmas Day. Such appropriation of ritual elements made the transition from one culture to another somewhat smoother. None of the public holidays or temple sites had to be changed. It was only a matter of allowing time for the indigenous population to get used to the new symbols contained within the ritual. Buddhist rituals, such as Wesak are no different. This process is undoubtedly how Wesak evolved into its present form in Southeast Asia, and continues to transform in the North American context. The earliest forms of Wesak that are available in chronicled texts provide evidence of a Buddhist ritual created through syncretic blending with other traditions that pre-date Buddhism. The few available references to Wesak are to be found in historical texts concerned with prominent Buddhist figures, such as Emperor Aśoka (304-232 BCE), and ancient chronicles such as the Mahāvamsa (the Great Chronicle). These references reveal an early form of Wesak that seems more akin to the spring harvest festival in Northern India than the austere practices associated with the Theravāda tradition. The historical connection between this Indian festival witnessed by the pilgrim Fa-Hsien and the Buddhist celebration, Wesak, still remains uncertain. This uncertainty is further entrenched when examined beside Rock Edict IV which refers to Aśoka' s advancement of the Dhamma by "showing the people displays of heavenly chariots, elephants, balls of fire, and other divine forms" (Thapar 251-252). While Fa-Hsien never mentioned the festival by name, he recorded that the event took place annually "on the eighth day of the second month" (Dutt 201). This places the celebration within the month of Vaiśākha in the Indian calendar, the name from which the term Wesak is derived. This calendrical connection is really the only evidence that suggests he was referring to an early Wesak festival. The inclusion of Buddhist images in the Hindu car festival provides an example of the transformation that occurs when two different religio-cultural traditions encounter each other. This passage, and the long history of blending between Hindu and Buddhist culture, indicates that Wesak is most likely an earlier Indian ritual appropriated, possibly by a figure such as Aśoka, to become a Buddhist expression of worship. William Geiger, in his book, Culture of Ceylon in Mediaeval Times, cites references from the Mahāvamsa which mention several Sinhalese kings who organized Wesak celebrations. The passages in the Mahāvamsa and the Cūlavamsa that Geiger provides as evidence of ancient Wesak celebrations are: 32:35; 34:59; 35:100; 36:40.109.130; 44:46; 51 :84. According to this source, the Sinhalese king Dutu-Gemunu (101- 77 BCE) was the first to embrace the tradition of Wesak celebrations. He is reported to have celebrated twenty-four Wesaks during his reign, and probably "revived a festival that had been in existence earlier and celebrated it on a grander and bigger scale than before" (de Silva 159). After king Dutu-Gemunu many kings are reported to have celebrated Wesak annually. Geiger's account draws special attention to a king "Sena II, ninth century, [who] celebrated the Veśākha festival with the poor, giving them food and drink and clothing as they desired" (Mahvāmsa 51: 84, cited in Geiger 199). Another example, culled from the Rock Edicts13, suggests that Aśoka also incorporated this charitable aspect into his vision of the Buddhist faith. According to Rock Edict XII, Aśoka "gave alms (dāna) and honored (pūjā) both members of religious orders and the laity of all religious groups (pārsada)" (Hirakawa 1 00). And in Rock Edict VII Aśoka states that he "wished members of all religions to live everywhere in his kingdom" (Ibid., 100). Within these early references to Wesak, this is the only mention of Wesak as a festival that incorporates a dimension of social charity. It is unclear if this indicates that it was a later development or just not mentioned in Fa-Hsien's earlier references to Wesak celebrations. With such a scarcity of historical sources referring to early Wesak celebrations, it is almost impossible to determine the origins of such a ritual. Given the fluid nature of ritual appropriation, particularly between Hindu and Buddhist cultures, it is probable that the earliest Wesak celebrations arose out of a pre-existing Indian ritual tradition. There is some evidence to suggest that Wesak's initial rise to prominence was due to the conversion of Aśoka to the Buddhist faith sometime during the seventh year of his reign. It was Aśoka who is said to have called the third Great Council of Buddhists, at which intensive missionary efforts to spread Buddhism abroad were made a priority. According to some Buddhist accounts, it was at Aśoka' s urging that his son, Mahinda, went to Sri Lanka where the Buddhist teachings were first written down in the Mahāvamsa (Singhal 8). Again, due to a lack of conclusive historical data, it is difficult to ascertain whether or not a form of Wesak existed in Sri Lanka before the Indian missionaries arrived. But, according to Romila Thapar, "it may be conjectured, with some justification, the Ceylon Vesak festival was modeled on Aśoka's 'shows and processions' and also on 'the processions of images' seen by Fa-H[s]ien" (Thapar 274). Now, in contemporary Sri Lanka Wesak celebrations comprise the highlight of the religious year for Buddhists. More evidence to indicate that non-Buddhist religio-cultural influences have effected a change in the Buddhist tradition can be found in the connections between the celebration of Wesak and the agricultural cycles of Southeast Asia. Buddhist festivals found in Southeast Asia reflect the rhythm of the agricultural cycle as much as they punctuate important events in the Buddhist calendar. Wesak, primarily a lunar ritual, is closely connected to the cycle of the months and seasons. These cycles provide the basic framework for the earliest communal festivals and celebrations. The fact that Wesak generally falls at the beginning of the Southeast Asian rice-planting season is an example of this syncretic process. During the time of the Buddha, the lunar calendar was the primary means of organizing time. The lunar method of reckoning (pivotal to ancient Indian calculations) divides the year into thirteen sections, or lunar months. In early Buddhism, the festival calendar also followed the cycles of the moon. For instance, Uposatha days, occurring on the full and new moon of every month, were designated as times for the ordained community of monks and nuns (the sangha) to gather and confess any violations of the monastic behavioral code. Similarly, a seminal Buddhist festival such as Wesak is usually scheduled to coincide with the full moon of a particular month. According to the Gregorian, or solar, calendar (introduced in 1583) it is the first full moon of the fifth month, which means it is celebrated in late Mayor early June. Compliance with this ancient prescription varies according to tradition, but regardless, the full moon remains an orientation point for the observance of important occasions. Buddhist festival calendars are still organized in accordance with the lunar cycles. Therefore the actual date of Wesak changes each year according to the lunar cycles. One of the primary reasons for the prevailing authority of the older lunar calendar (despite the advantages of solar reckoning) is that it grounds contemporary practices in the 2,500 year-old Buddhist traditions through the commemoration of an important historical event. "The very fact that Wesak is determined by phases of the moon shows its connection to an older time dominated by agricultural notions of time" (Hori, August 15,2001). Thus, by aligning natural and historical phenomena in this way, Buddhist identity maintains a strong sense of continuity. Regardless of whether or not the Buddha's birth, death, and enlightenment took place on the same day (in fact it is more than likely that they did not), the moon and its cycles retain symbolic importance for Buddhists. In the rural villages of Southeast Asia, the connection between Buddhist rites and the agricultural cycle is especially strong. The harvest of rice is a prime example of an important agricultural event that dictates the religious calendar in the region. Wesak (May) falls at the beginning of a period where villagers are concerned about getting enough rainfall to ensure a good harvest. This period ends with the advent of the rain retreat for the monks (July). S. J. Tambiah, a social anthropologist who has conducted extensive research in the rural areas of Southeast Asia, describes this period as being very strenuous for villagers. Tambiah explains that the Wesak ritual consists of feeding the monks in the morning and then processing around the local temple three times carrying lighted candles and incense (Tambiah 154). According to Tambiah, Wesak is celebrated in these areas because it has been "popularized on a national scale" and because Wesak has been a long-standing Buddhist tradition (Tambiah 154). In these rural areas, religious rituals such as Wesak are inextricably bound to the agricultural calendar. Further evidence of the syncretic nature of ritual and the continuing appropriation of Wesak into indigenous traditions is found in the various present-day New Age15 movements in North America and Europe. Searching for "Vesak", "Visakha", “Vesakha", or "Wesak" on the Internet can provide access to these groups. Some of the more interesting examples of New Age movements that include Wesak in their repertoire of ritualized ceremonies are: Alice A. Bailey's Arcane School of Knowledge; Dr. Joshua Stone's Melchizedek Synthesis Light Academy (MSLA); and Temple of the Holy Grail (THG). Alice Bailey's school will provide the focal point for this examination of Wesak and New Age groups since this group has the most prolific store of knowledge about Wesak. All three groups adhere to the same calendrical routines and share common democratic qualities such as tendencies towards egalitarianism and "fusionist" mandates, i.e., the blending of religious traditions apparent in their philosophy and practices. According to representatives of the Arcane School of Knowledge, Wesak is even referred to in the Book of Revelations (Rev. 7:9-17) in the Bible (Bailey 1951 b, 2). Christ is the representative of the Western religious tradition, and the Buddha is the eastern representative. According to Bailey "There is no divergence or conflict in their teaching. There is no competition between Them. They stand forth as the two greatest world teachers and saviors. One has guided the Orient and the other has guided the occident closer to God" (Bailey 1951a, 238). The calendrical representation of this syncretic fusion becomes manifest in the celebration of Wesak (fixed by the May full moon of Taurus) and Easter Sunday (fixed by the April full moon of Aries). These two celebrations, represent the "illuminated Buddha and the Risen Christ" (Ibid., 239). Many of these new movements give reference to early Pagan rituals celebrated in accordance with the seasons, and astrological calculations based in the seasonal cycle i.e. the spring equinox. Wesak, being a lunar festival celebrated in the spring, is also associated with the seasons or the rotations of the moon. Historically, within the cultures of Southeast Asia, Wesak was used to appropriate local planting rites. Now Wesak is being re-appropriated by groups that organize their annual calendar in accordance with the cycles of the agricultural seasons. Through this appropriation of the Wesak festival by North American and European New Age groups, a symbolic bridge between tradition and innovation is created. In this way ritual connects past, present and future. "Broadly speaking, as a cultural institution a religion will inevitably be syncretistic" (Swearer 11). Within the countries of Southeast Asia there is a long tradition of blending between other cultures and Buddhist ideas, iconography, and ritual acts. There have been attempts by various historical figures, such as Thailand's King Mongkut (1804-68), to purge Buddhist practice of any popular influences but, generally, the existing Buddhism of Southeast Asia is a combination of both classical Buddhism and non-Buddhist beliefs and practices. Wesak has survived by incorporating elements of these other religio-cultural traditions while still maintaining its identity as a Buddhist ritual. This is evident from its possible roots within the religious traditions of the Indian subcontinent through its association with the agricultural cycles of Southeast Asian society and finally with New Age groups in a Euro-American setting. The thread of continuity is provided, paradoxically, by the transformation of this ritual within each cultural milieu that it encounters. Thus, Wesak functions as a marker of tradition as well as a source of "innovatory potential" (Kertzer 12). As Kertzer points out, "Paradoxically, it is the very conservatism of ritual forms that can make ritual a potent force in political change" (Kertzer 12). The aim of this chapter is to provide an example of how, through a sustained period of exposure to western influences, Wesak has functioned to consolidate Buddhist self-identity in Sri Lanka. Infiltration of Sri Lanka by the colonial Other, represented first by the Portuguese, then the Dutch, and finally the English, brought a host of western values and practices i.e., the Christian religion and strategies for education of the local population. Before the arrival of the colonialists, according to the available resources, Wesak was a ritual event limited to the confines of the Buddhist temple. As the colonial presence became more ingrained within the fabric of Sinhalese culture, and Christianity gained popularity even among the local Buddhist population, it became evident that the Buddhists would have to find a means of competing with this Christian influence. The Buddhist response came in the form of blatant appropriation of the more effective Christian practices. Wesak became the Buddhist political tool for mitigating fascination with devotional Christian festivals such as Christmas. Although Wesak has been celebrated in Sri Lanka for almost two millennia, it has evolved into a very different form characterized by the inclusion of western innovations. In fact, the Sinhalese Wesak is unique throughout the world for the Christian flavor of its festivities. Some examples of the more obviously Christian-based practices found in contemporary Wesak celebrations are: erecting nativity scenes; carol singing; and sending Wesak cards. The inclusion of these festive elements in Wesak's ritual content stands in stark contrast to the earlier closed rituals before the arrival of the colonialists. This examination will reveal how the Wesak ritual functioned as a catalyst in the ensuing Buddhist revival that was prompted by the colonial other. Historical connections between Sri Lanka and the figure of the Buddha further reinforce the deeply rooted relationship between Sinhala identity and Buddhism. For instance, although "the Buddha, so far as is known, never visited Ceylon" (Ludowyk 12, cited in Greenwald 14), according to the mytho-history contained in the Mahāvamsa, he purportedly visited the island three times shortly after his enlightenment in order to make Sri Lanka "a fit dwelling place for men" (Mahāvamsa 1 :43, cited in Greenwald 14). On one visit, the Buddha allegedly left a fossilized footprint on Adam's Peak (Mt. Sumanakūta). By locating its Buddhist identity in the acts of the Buddha himself, this legend authenticates the Sinhalese religio-national sense of identity. In Sri Lanka, Wesak marks the day on which, according to legend, Prince Vijaya, the founder of the Sinhalese race, landed on the island (Disanayaka 1). Historical connections such as these deepen the psychological connection between Buddhism and Sinhalese identity. It is also noteworthy that this day was the full-moon day of Veśākha (Wesak), reference to which "recurs consistently throughout the chronicles at moments of “significant occurrences" (Greenwald 15). Such mythical parallels drawn between Sinhalese history and the figure of the Buddha reveal the extent to which accounts of Sinhalese history are inextricably linked to the Buddhist tradition. This blending of the political and religious within Sinhalese tradition is reflected clearly in the term dhammadīpa, "where dhamma indicates the religious aspect and dīpa ("island") the political aspect" (Clifford 45). This reciprocal relationship is maintained and legitimated through the historical continuities outlined in the Chronicles. Possibly the most influential of these lineage holders besides the Buddha was the Indian Buddhist monarch, Aśoka. "Traditionally, the installation of Buddhism as a religion of state is traced back to Aśoka" (Rahula, 1956: 62, cited in Bechert 6). According to Kitsiri Malalgoda, "Buddhism was introduced into Ceylon during a period when the connection between Buddhism and political authority was already developed to a high degree under Aśoka" (Malalgoda 12). As the paradigmatic Buddhist ruler, Aśoka served as a role model for Sinhalese rulers and in so doing, furthered the development of a Buddhist Sinhala identity. For instance, Tissa (250-210 BCE), Aśoka's contemporary in Sri Lanka, is generally acknowledged for establishing the institution of kingship in Sri Lanka (Malalgoda 12). The Sinhalese monarch was "customarily described as a cakravartin--a universal monarch described in canonical Buddhist works. He was also identified as a bodhisattva, i.e., a Buddha-to-be, and his legitimation was bound to his function as a promoter and protector of orthodox Theravāda Buddhism" (Bechert 8). Buddhist icons such as the tooth relic of the Buddha, his almsbowl, and a piece of the Bodhi tree under which the Buddha is said to have achieved enlightenment are all mytho-historical artifacts that have been used to legitimate the rule of a particular monarch. With a long tradition of Buddhism, and as guardian of one of the relics of the Buddha (one of the Buddha's teeth), Sri Lanka also places great emphasis on the Wesak festival, now the most important holiday in the Theravāda tradition. While the importance of Wesak for Sinhalese Buddhists has not dwindled since the introduction of Buddhism to Sri Lanka, there has been a marked change in the ritual content and orientation between early closed monastic Wesak rituals and the more public contemporary celebrations. Even as late as the nineteenth century, Wesak festivities occurred solely within the confines of Buddhist temples, such as Kelaniya, near Colombo, and were limited to "lighting lamps, offering flowers, and observing the [Buddhist] precepts" (Somaratna 4). Before the arrival of the colonialists, Buddhism in Sri Lanka was secure as the state religion under the patronage of the monarchy. In 1505 the Portuguese arrived in Sri Lanka and ushered in an era characterized by hostility towards Buddhism. The Portuguese severed the mutually supportive relationship between the Buddhist sangha and the government by establishing Roman Catholicism as the state religion. When the Dutch replaced the Portuguese as colonial masters in 1656, the state religion changed from Roman Catholicism to Reformed Protestantism (Dutch Calvinist), but the hostility towards Buddhism endured. Soon Christian missionaries initiated a campaign that harnessed technological innovations such as the printing press to disseminate Bibles and a variety of anti-Buddhist tracts. These evangelization attempts were designed to secure Christianity a place in the Sinhalese culture regardless of state changes in policy towards religion. Sinhalese Buddhists responded to the evangelization and "civilization" of their island with a Buddhist revival, one that utilized the political strategies of the colonial Other. The Buddhists adopted many of the more effective dissemination methods used by the Protestants in order to compete for the patronage of the populace. Somaratna refers to the actions of Mohittiwatte Gunananda (1823-1891) who employed Christian missionary methods of organization in order to preserve Sinhalese Buddhist culture. Some of the organizations he was instrumental in forming based on the missionary methods were: "Society of Bo tree lovers" (Budhiraja Samitiya), "Society for the protection of Abhagagiri Stupa" (Abhagagiri Caitya Araksaka Samitiya), and "Society for the Propagation of Buddhism" (Sarvajna Sasanabhivruddhi Dayaka Samagama) (Somaratna 6). In an ironic twist, the Sinhalese Buddhists were reclaiming their own traditions, using Christian innovations. There are two main reasons why Wesak celebrations in Sri Lanka underwent a drastic metamorphosis. First, Sri Lanka in the nineteenth century was saturated with Protestant Evangelists. "Christianity, which was associated with the colonial package received much of the criticism associated with the grievances of the emerging Sinhala Buddhist elite" (Somaratna 5).19 The Christian religion was an obvious target for anti- colonial sentiments since the popularity of their festivals, such as Christmas, were gaining favor with the Buddhist populace which had no similar vehicle through which to express its religious sentiments. This challenge to the authority of the Buddhist leadership in nineteenth-century Sri Lanka was reason enough to "counter the rising tide of Protestant evangelism in Sri Lanka" by, in a sense, re-appropriating their own festival calendar (Somaratna 4). The second reason why Wesak was an effective vehicle for social change was that Buddhist leadership was changing from the monks to the lay people. This increased level of lay involvement, due to the Protestant Christian activities in the field of education, displaced the traditional teaching roles filled by monks (Somaratna 5). The challenge to the traditional Sinhalese educational system presented by Christian missionaries required more lay involvement in order to meet the needs of a Buddhist population in danger of compromising its religious heritage. The Buddhist Defence Committee, formed by and consisting mostly of Buddhist lay leaders, is an example of this shift in traditional leadership roles. In the case of Sri Lanka, the involvement of the laity was essential in terms of countering the Protestant tide, but it also motivated the sangha members to become more involved. In the context of Sri Lanka, this produced a stronger sense of Buddhist identity and group cohesion. Monastic and lay Buddhists united and participated in the movement to reclaim their spiritual heritage from the Other, the Christian presence. Although Colonel Olcott20 was neither the originator nor culminator of the Buddhist revivalist movement in Sri Lanka, his role as "organizer and articulator" (Prothero 174) was indispensable. He was instrumental in providing the foundations for what has come to be known as "Protestant Buddhism".21 In an attempt to consolidate Buddhist teachings into an easily accessible format for use in a Buddhist education system in Sri Lanka that would rival the one introduced by the Christian missionaries, Olcott compiled The Buddhist Catechism in 1881. This work presented a "serious challenge to traditional Theravāda Buddhism", and became a standard textbook in Buddhist schools all over the island (Prothero 10). The arrival of the Theosophists in 1880 also marked a significant period in the revitalization of Buddhism in Sri Lanka. Under Olcott's leadership, institutions and practices such as the Buddhist Sunday schools, Buddhist schools, Buddhist Catechisms, collection tills, salpil in the Sinhalese language (taken from the Christian harvest festivals), and sammadam (fund raising in Sinhalese), which fell under the umbrella project called the Buddhist Education Fund were established (Somaratna 6). All of these western style traditional organizations were adopted and used by the Buddhists to bolster Buddhist support in response to Christian missionary activities. The Theosophists, being Westerners who were familiar with Christian methods of organization and evangelism, came to Sri Lanka at a fortunate time for the Sinhalese Buddhists. There was already anti-colonial sentiment among much of the population, and to have the support of the Theosophists, who appeared as anti-Christian colonialists to the local population, fueled the Buddhist revivalist movement. The quest for a more equitable treatment of Buddhist practitioners began following a riot on March 25, 1883, between Christians and Buddhists in Kotahena, a predominantly Christian area in Colombo (Prothero 110). The riot occurred after "a Roman Catholic mob attacked a Buddhist procession which passed their cathedral on its way to Deepaduttamaramaya, the temple of the militant Buddhist leader, Mohittiwatte Gunananda Thera" (Somaratna 8). The government investigation concluded that, although no charges were pressed on either side, the root cause of such a disturbance was undoubtedly the Buddhist Revival currently happening in Sri Lanka (Prothero 111). In order to preempt any more riots, the government declared that it would be in the best interests of religious harmony if the freedom to hold processions (and even beat tom-toms) in Buddhist temples be prohibited for at least two years (Somaratna 8). As a result of this restriction on Buddhist freedom of expression, lay leaders organized to fight for the fair treatment of Buddhists by the governing powers. The decision by the Theosophists to inaugurate the Buddhist Education Fund on the Wesak Poya (full moon day) of May 13, 1881 is one example of how useful the Wesak festival was as a tool for revitalizing Buddhism (Somaratna 6). The next step in the organizational activities of the Sinhalese Buddhists was to make the Wesak full moon day a public holiday in order to further the connection between the government and the majority religion, Buddhism. One of the reasons for wanting a public holiday arose from the colonial restrictions on Buddhist expression, primarily in the form of banning processions. Making Wesak a public holiday would officially give legal rights to Buddhists. Of the six requests, only two were granted. The first was the loosening of the restrictions surrounding the use of musical instruments used in religious processions. The second request granted was the declaration of Wesak as an official holiday in Sri Lanka. The idea of a public holiday was foreign to the Sinhalese people. Wesak, the highlight of the Buddhist annual calendar, was not recognized as a public holiday even by the Sinhalese kings who ruled before the colonialists arrived in 1505 (Somaratna 7). However, Wesak was declared a public holiday on March 27, 1885 by the British governor, Sir Arthur Gordon (1883-1890). The first Wesak full moon day fell on April 28, 1885 (Somaratna 7). The Buddhist flag designed by Olcott can be found in many Theravāda Buddhist temples throughout Southeast Asia, as well as in North America. The Portuguese introduced Christmas decorations into Sri Lanka in the sixteenth century (Somaratna 11-12). Part of the traditional Roman Catholic Christmas displays included the construction of nativity cribs and the recreation of the nativity itself. The Buddhists began to erect Buddhist nativity scenes. Instead of the usual host of Christian characters, the Buddhist version depicts the Buddha's birth at Lumbini garden with queen Māya replacing Mary, and usually portrays the baby Siddhattha walking over seven lotus flowers, since he was said to have been able to walk at birth (Somaratna 12). This reconstruction is a very popular tradition on Wesak day in Sri Lanka, and "today many households recreate the birth scene as part of their celebrations in all parts of Sri Lanka" (Somaratna 12). Wesak in Sri Lanka also became a festival of lights. During the celebrations, the lighting of various candles and lamps not only adds to the festival scenery but is also a metaphor for the "light" that dispelled the darkness of ignorance or illusion through the Buddha's enlightenment. Traditionally, lamps have been fashioned out of clay or the skin of raw fruit such as papaya. A more recent introduction takes the form of Wesak lanterns. The Roman Catholics lit lanterns to celebrate "the days of the saints to whom the churches in the villages were dedicated" (Somaratna 12). The Sinhalese Wesak lanterns (Wesak kudu) are replicas of the Portuguese lamps, called lampiao. To the praise of our Lord Our voices shall be lent In tuneful accord. And cease from all wrong. Come ye, 0 come ye to Bethlehem. Sinhalese Buddhists continue to innovate and modernize their Wesak festivities. In 1992, a Buddhist "cantata" was presented during Wesak for the first time, and later choreographed segments were also added (Somaratna 13). In fact, popular Sinhalese dancing has also been adapted to fit the Wesak festivities. Wesak decorations have now become a part of the celebrations in Sri Lanka. Decorating the streets with colourful regalia was, again, not a common Buddhist practice but one that the Sinhalese population was familiar with from the Christmas decorations used by the Portuguese. Lamps and paper lanterns were imported from China and Japan for the celebrations (Somaratna 14). Other additions to Wesak festivities from the Christian tradition include Wesak cards (See Appendix 3), whose "structure and purpose... are not different from the Christmas card except for the use of Buddhist symbols in them" (Somaratna 15). Also Wayside Dramas, a Roman Catholic tradition reenacting the life of Christ, were adapted to suit Buddhist needs by substituting stories from the Jātaka Tales for the narratives of the life of Christ. Sinhalese churches perfonn their dramatic interpretations of the founder of their religion in a structure built onto the side of the church. Buddhists have now appropriated this custom and perform their own version on the streets of Colombo during the Wesak festivities (Somaratna 15). The themes promote Buddhist values such as generosity (dana), discipline (sila), wisdom (panna), and patience (khanti). The Sinhalese Buddhists are familiar with the themes, and as Disanayaka points out, "They come to watch the Wesak plays not to learn something new but to confirm again and again what they already know" (Disanayaka 26). "Etiquette and ceremony can go to the heart of constructing relationships of political submission and dominance" (Bell 133). The incorporation of Christian symbolism into contemporary Wesak celebrations enables Sinhalese Buddhists to rival the popularity of colonial rites, such as Christmas, amongst the local population who are already familiar with the symbolism of the nativity scene, carol singing etc. Among other things, Christianity was associated with a rising middle class in Sri Lanka, whereas Buddhism was often associated with life in rural areas of Sri Lanka. By imitating the celebratory techniques utilized by the colonialists, Sinhalese Buddhists were able to compete with Christianity as the religion of choice for the island's influential new middle class. The transformation of the Wesak ritual in Sri Lanka is an interesting, and relatively recent, example of how the Christian Other has influenced Buddhist identity. Sinhalese Buddhists successfully navigated the encounter with the colonial package, i.e., Christianity and western techniques of education, through imitation of these techniques. It is ironic that anti-colonial colonialists, the White Buddhists or Theosophists such as Colonel Olcott, aided the Sinhalese Buddhists. Buddhists aligned themselves against the Christians by reinventing their own tradition through the appropriation of Christian tactics. The ritual content, involving the incorporation of Christian imagery and celebratory techniques, helped to bestow equal socio-cultural power to Sinhalese Buddhist identity. The result has been a resurgence of Sinhalese Buddhism and society, reflected through the festive and public nature of Wesak. This Chapter deals specifically with Wesak in North America, first, by tracing the historic beginnings of Buddhism and Wesak, and second, by providing descriptive accounts of five different Buddhist celebrations. This mainly descriptive chapter provides data through which to examine North American adaptations of the Wesak ritual and of Buddhism in general in Chapter Six. In his article "Buddhism in Metropolitan Toronto: A Preliminary Overview," Suwanda Sugunasiri identifies four phases of Buddhist immigration into Canada. Chinese workers who, attracted by the gold rush, eventually settled in California probably introduced Buddhism, as a religious tradition, into North America in the mid-1850s. They established Chinese temples that were a mixture of Taoism, Confucianism, and Buddhism (Fields 74). From California, and then directly from Hong Kong, six or seven thousand Chinese migrants gradually made their way to British Columbia, constituting the first phase of Buddhist immigration to Canada (Sugunasiri 84). The second phase of immigration began around 1880 with the hiring of predominantly Chinese, but also some Japanese, to work on the CPR (Burnett, cited in Sugunasiri 84). The third phase began around 1908, and brought large numbers of Japanese Buddhists, adding to the influx of Chinese immigrants and their syncretic form of religion. These early Chinese and Japanese Buddhist immigrants brought the Mahāyāna tradition of celebrating the Buddha's birthday, precursor to current Wesak celebrations. The fourth and final wave of Buddhist immigration, the period following World War II, was "more like a continuation of the three earlier ones as more and more family members continued to join their relatives in Canada" (Sugunasiri 85).22 This latest wave of Buddhist immigrants was further strengthened by the loosening of immigration laws in Canada and the United States in the 1960s, allowing for a sudden and continuous increase in immigration from traditionally Buddhist countries in Southeast Asia. These four phases of immigration resulted in the establishment of Buddhism as a strong, albeit minority, presence in Canada. The first World Parliament of Religions held in Chicago in 1893, was a landmark event for the future of Buddhism in North America. It precipitated the establishment of some of the first Buddhist groups completely sustained by western converts to Buddhism (occidental Buddhists). In May 1897 in San Francisco Anagarika Dharmapala, a Sinhalese reformer and founder of the Mahā Bodhi Society, was the officiant for quite possibly the first Theravāda Wesak celebration to be held in North America. In his narrative history of Buddhism in America, How the Swans Came to the Lake, Rick Fields describes the service in which 37 candles symbolizing the 37 principles of wisdom burned in front of 400 people while Dharmapala chanted the Mangala Sutta from a palm leaf manuscript (Fields 134). One of these pioneer groups was a branch of the Mahā Bodhi Society, which is said to have organized a Buddha's birthday celebration at one of the member's houses in May 1898 (Tweed 1992, cited in Nurnrich 118). From these humble beginnings, Buddhism has now become a strong social and religious presence in North America. By the 1980s, Asian-Americans had become the third largest minority group after Blacks and Hispanics (Schaefer 1993, cited in Nurnrich 123). In Canada, as of 1984, Buddhism had become the fastest growing religion (McLellan 1996, cited in Numrich 123). With the increase in immigrants from traditionally Buddhist countries, the organization of pan-Buddhist groups and collaborative festivals such as Wesak were developed. This section describes the proceedings and ritual content of the different celebrations I attended during the Wesak season (May-June 2000). These descriptive accounts of North American Wesak festivals, divided into pan-Buddhist groups, single tradition groups, and the Buddha's Birthday, will provide the data from which to contrast and compare the characteristics of each ritual. While all of the rituals are linked through their commemoration of the important events in the Buddha's life, the manner in which this devotion is manifest reveals the diverse nature of Wesak celebrations, and in turn, the Buddhist communities dwelling in North America. The Chicago Wesak took place at the Thai Theravāda Temple, now called Wat Dhammaram. It was established in 1976 and originally located at North Hoyne Avenue in Chicago's "predominantly Hispanic neighborhood" (Numrich 1996, 3). Originally an Evangelical Lutheran Church constructed in 1892, the newly acquired space quickly became the residency for two Thai monks previously living in New York. One of these monks, Phra Sudhiratanapom, is still the abbot of this temple (Numrich 1996,2). Growth in Chicago's Thai community in the late 1970s and early 1980s necessitated a move to a larger space. A former elementary school located at West 75th Street and Harlem Avenue in Chicago's southwest side was secured as the new temple site in July 1983 (Numrich 1996,4). This ten-acre plot is the current location of Wat Dhammaram Thai Temple and Cultural Center. As the name suggests, the temple area is not only a place where religious rites are observed, but also one where cultural activities are available. While I was attending the Wesak celebrations, there were three teachers from Thailand (one man and two women) who had all been there for at least a year, and were in charge of teaching everything from the Thai language to traditional Thai music to the young teens in the community. Wat Dhammaram is a refuge for Thai culture in America. The area around the temple consists of a large grassy area scattered with trees and a vegetable garden in the back surrounds a large two-story red brick building. Inside the building there is enough room on the floor of the main shrine room to hold more than five hundred people (Numrich 1996, 9) with the option of using cushions or chairs to sit on. Upon entering, one's attention is immediately drawn to the impressive fifteen-foot tall figure of a golden seated Buddha "with hands in a teaching gesture (vitarka mudrā): left hand in lap, palm upwards, right hand resting on right knee, palm facing outward to viewer, thumb and forefinger touching together" (Numrich 1996, 3-4). This statue, named Phra Buddhajinadhammobhas, was presented to Wat Dhammaram by the king of Thailand in 1978, while it was still at the Hoyne Avenue residency. To the left, facing the golden Buddha, is a smaller table housing an equally impressive, but smaller statue of a seated Buddha. Behind the main Buddha are six flags, three on either side. U.S.A. flags flank the four central ones, which are, from left to right, the Thai national flag, the flag of Chicago, the Illinois state flag, and Olcott's Buddhist flag (a red dhammacakka against a backdrop of yellow). Across from the entrance, to the right of the main Buddha, is a raised platform (approximately 3 feet by 30 feet) on which the monks sit in rows during formal ceremonies. During the Wesak celebrations, in order to accommodate the overflow of overnight guests, some spend the night on the floor of the main shrine room. Tibetan: Shambhala Meditation Center; Tibet Center (Cultural illstitute founded by the Dalai Lama for the preservation of Tibetan culture); Chicago Karma Thegsum Choling (ill the tradition of the Seventeenth Gyalwang Karmapa). Theravada: Buddhadharma Meditation Center (Thai); Chicago Insight Meditation Group (Vipassana); Midwest Buddhist Meditation Center (Thai); Buddhist Vihara (Sinhalese). Mahāyāna: International Buddhism Friendship Association (Vietnamese); Buddhist Temple of Chicago (Originally Chicago Buddhist Church, est. 1944; Pureland); Zen Buddhist Temple of Chicago (est. 1947; Soto Zen); Great Plains Zen Center (Soto Zen); Zen Buddhist Temple (Korean); Hanmaum Zen Center (Korean); Milwaukee Zen Center. Non-Sectarian: Heartland Sangha, American Buddhist Association. Participants consisted of approximately one hundred lay Caucasians and other westerners. There were conspicuously few people in the congregation, with the exception of the monastics, who looked Asian. This part of the group sat on chairs divided into two groups of fifty. Within this group there were ten lay leaders, some wearing robes, who occupied the front row of chairs. There were eleven Thai monks present, four Burmese monks, two Zen priests, and one Tibetan representative. Approximately two-thirds of the entire group, and all of the monastics, were male. No children were present. Awaken to the way of peace and harmony. 11:00 A.M. All others exit. The service began as soon as the lay participants were seated in their chairs. The ringing of a temple bell signaled the entrance of the monks who, led by the most senior Thai monk, Achan Chuen Phangcham, processed around the chairs to the front of the room and offered a lighted candle to the statue of the Buddha. The monks then took their place on the raised platform at the side of room. The lay representatives then entered each carrying a bouquet of flowers. Before the chanting, a lay representative from the BCM announced that every stage of the ritual service would be introduced in English to the participants. The first section of chanting, Homage to the Buddha the Triple Gem, was led by the Theravāda monks and was chanted in pāli. A Caucasian looking Zen priest led the next chant, the Heart sūtra, in English. During the chanting of the Heart sūtra, a representative from each temple offered incense, sweet tea ablution of the Baby Buddha image, fruit to the standing Buddha image, and flowers to the reclining Buddha image. Next, the lay members of the congregation bathed the Baby Buddha image. After the bathing of the Buddha statue the President of the BCM, Asayo Horibe, welcomed everyone to the 16th Annual Visakha (Wesak) Festival and introduced the keynote speaker, Reverend Brian Bauerle, who spoke for about forty-five minutes on the topic of joyfulness. To signal the end of the formal component of the celebration a chant of blessings was led by the Theravāda monks, who then processed out followed by the lay representatives and finally the rest of the congregation. The monastics were then served traditional Thai food in a separate room from the rest of the participants. During this time period many different Buddhist groups set up promotional stalls in the hallways of Wat Dhammaram. Some of the groups did not actually attend the religious service but used the occasion as a convenient venue to promote their own centers. Tanya Suesantisook, formerly Miss Thailand World, hosted this aspect of the celebrations. She now leads meditation retreats. The ritual site for Day 2 of the 16th International Visakha Celebrations in Chicago were also held in the main shrine room at Wat Dhammaram. The congregation present on Day 2 of the proceedings consisted of mostly Thai immigrants. The hall was full once again with approximately 150 people in attendance. The monks affiliated with Wat Dhammaram were the only monastics who participated in the ceremony. The two days of Visakha festivities seem to have been divided along ethnic lines. While on Day 1 the majority of the congregation consisted of Caucasians, Day 2 of festivities was oriented toward the Thai immigrant community. Amongst this latter group were the Thai Ambassador to the United States and his wife. The ritual began once the laity were seated and the monks had casually processed in taking their usual seats on the raised platform adjacent to the main altar. The most senior monk then led the congregation in the Morning chanting that is usually observed at Wat Dhammaram, and a special loving-kindness chant (Metta-bhavana). After an hour and a half of chanting alms (money) offerings (Tak-bat) were presented to the statue of the Buddha. This involved the laity filing up to the statue and ceremoniously placing an envelope with money inside onto a silver tray lying on the main altar. Next, the monks performed a Blessing Chant for the alms that were offered. In between the morning and the afternoon rituals lunch was served to the monks and laity in separate rooms. After lunch, the group reassembled in the main shrine room for a dhamma talk by a temple monk. Next, the Thai ambassador presented the head monk with the Phapa Tree, a tree with dollar bills taped to its leaves and stem. A Thai gentleman, speaking the Thai language, then thanked everyone for attending the event. Marking the end of the program, the monks performed rejoicing Chants. The first pan-religious Montreal Wesak celebration was held at the Tibetan Manjushri center in Longueuil, a suburb of Montreal. The building itself was converted by members of the Manjushri community from a restaurant into a spacious area now used for sacred rituals. As one enters the building, to the right there are stairs leading up to a living room area, and directly in front is an efficient-looking kitchen space useful for catering religious events such as Wesak. To the left is a large open space (50 feet by 30 feet) that constitutes the ritual area. There is enough room to comfortably seat at least a hundred people on cushions on the floor. The front row of cushions is red for the sangha, and the rest are blue for the laity. There are colorful Tibetan thangkhas hanging on both sides of the room, and delicate streamers shaped like windsocks dangling from the ceiling. At the far end of this main hall sits an ornately decorated shrine. There is a large standing golden Buddha directly in the middle, flanked by framed pictures of the Dalai Lama, both alone and greeting various monks and dignitaries. A long white scarf, representing the Buddhist notion of the interconnectedness of all things, runs through and around the large Buddha and the two-dozen smaller Buddhist icons that cover the main altar. A skylight provides natural lighting to illuminate the proceedings. To honour this festive occasion there are also fresh flowers (pink carnations, sunflowers, and daisies), fruit, and an assortment of muffins on tables around the main altar. To complete the scene are requisite bowls filled with burning joss sticks and many small, lit candles which dot the space and lend a soft warm glow to the proceedings. Tibetan: Manjusri Buddhist Center; Kankala Buddhist Center; Rigpe Dorje Foundation; Rigpe Quebec. Theravāda: Agga Pannarama Meditation Center; West Island Mindfulness Meditation Group. Mahāyāna: Zen Center on the Main; International Buddhist Progress Society of Montreal (IBPS). Academia: Professor Victor Sogen Hori (McGill University). In total, there were approximately 150 people present at the Wesak festival. Women accounted for at least two-thirds of the group total. Due to the location of the celebrations, almost one third of the participants were of Tibetan origin. Westerners, or Caucasians, comprised about half of the group. The rest of the congregation was primarily Chinese (IBPS representatives) with one monk from Bangladesh present. Very few children were in attendance. One toddler was sleeping in a comer and a couple of pre-adolescent children were present. The service began very promptly at 11 A.M. with an opening bell urging people to take their seats. The host, Louis Cormier, a twenty-year veteran of the Montreal Buddhist scene, gave an opening address explaining the process whereby this Wesak came to be. In particular he thanked the Venerable Thich Quang Due of the Vietnamese Vulture Peak Meditation Center for his insight and vision in initiating the organizational meetings that culminated in this celebration. He also provided a French translation to the English commentary. The ritual liturgy contained elements from the Theravāda, Mahāyāna, Vajrayāna, and academic strains of Buddhism. The first ritual act performed was the chanting of Homage to the Buddha in Pāli, led by Venerable Bhante Visuddhacara of Agga Pannarama Meditation Center. A period of Tibetan chanting, which lasted for about 15 minutes, was then led by the Tibetan leader, Yeshe Jimpa. The entire audience was standing during the chanting period. At the end of this chanting, white scarves, similar to the one entwined on the main altar, were handed out to those affiliated with the Tibetan tradition. People then came forward to receive a blessing from the highest-ranking lay elder present. This was administered by placing the scarf around their necks as the recipients bowed and touched foreheads with hands in a prayer position. Next, Prof. Victor Sogen Hori, a professor in Religious Studies at McGill University, gave a talk entitled, "The Meaning Of Vesak", which emphasized the many different forms of Wesak, in Southeast Asia and now in North America. Since this was the very first co-religious event to have been sponsored by the Montreal Buddhist community, this short talk provided some necessary historical references to other Wesak celebrations. This helped to define the current Wesak as the latest celebratory innovation within a long tradition of Buddhist Wesak festivals. This discourse served as an informal dhamma talk. Next, the Venerable Man Hung, the IBPS23 monastic representative, led a period of chanting in Chinese. Two women in brown robes (indicating their status as precept takers for the day) kept rhythm on a small wooden drum and a pair of hand chimes. After the chanting, a table containing a statue of the Buddha pointing to the ground and to the sky (similar to the one used by the IBPS at their Buddha's Birthday Celebration) was brought out from the edges of the room to the middle. The two sangha members, Venerable Man Hung and Bhante Vissudhacara, and two lay Tibetan representatives, who led the respective chanting periods, were the first to pay their respects to the Buddha by pouring water on the statue's body. Louis Cormier made an announcement before the bathing began, asking that out of respect no one should pour water on the Buddha's head, only on his shoulders and body. True to the communication problems typical of multi - ethnic gatherings, there were those who did not understand the request and poured water on the Buddha's head. The host then thanked all those who had helped from the Manjushri center, the ordained sangha members who led the chanting, and Prof. Hori who had done much of the organization for the event. This aspect of the proceedings consisted of informal discussion between the participants in the celebration. The host community, the Tibetan Manjushri Center, provided an informal snack of beverages and a variety of different kinds of cookies. The inclusive, highly public ritual expression that characterizes pan-Buddhist celebrations stands in stark contrast to the more private Tibetan and Burmese Wesak rituals that I attended in Montreal and Vancouver respectively. Location: 252 E. 65th Ave. The temple is a small three-bedroom house situated on the East side of Vancouver. The only permanent occupant is U Pannobhasa, the presiding monk from Myanmar, requested by the Burmese community in Vancouver. The house/temple has many windows and a modest front and backyard. Inside are a small kitchen, living room, and a bedroom. The living room serves as the main place of worship. It contains a small altar approximately 3 x 3 ft. across. Behind the altar is a large (2 x 4 ft.) flag of Myanmar. The centerpiece of the room is a 3.5 ft. white, porcelain representation of the Buddha with a flashing electric halo radiating out from the head in all directions. This Buddha sits in front of the flag and directly in the middle of the altar. The rest of the surface is brightly adorned with green plants and fresh flowers in vases, and a variety of carved renditions of the Buddha spread out across the top. The walls are sparsely decorated with tourism posters of Myanmar "The Golden Land", and framed pictures of tourist attractions in Myanmar. There are multi-colored Christmas style lights hung along the edges separating the walls from the ceiling. For dhamma talks and rituals, the monk sits in the northeast corner of the shrine room beside the main altar. Beside him is a small table that holds an assortment of offerings, ranging from packaged soap to canned corn. The regular attendees consist of about forty Canadians of Burmese decent; most were born in Myanmar. About half of the members are men and half women. For this particular celebration there were more people attending than usual. A family of Burmese people had traveled from Seattle specifically for this Wesak celebration since Vancouver contains the closest Burmese temple. This brought the total to about eighty people. There were only a handful of small children under the age often in attendance. There were also a handful of teenagers present. The rest of the attendees were middle-aged (40- 60 years of age). Five Caucasians attend the weekly meditation sittings that occur on Tuesday evenings, but there were only three Caucasians who attended the Wesak ceremony. The service began with a traditional Welcome Chant led by the resident Burmese monk and an offering of incense to the statue of the Buddha that sat on top of a small altar. Next, was the recitation of the Heart sūtra and the Calling of the Names of the Buddha by the entire congregation. In its entirety, the chanting component, performed in Pāli, lasted for approximately twenty minutes. Following this was a dhamma talk delivered by Siyado (teacher in Burmese) in Burmese, which lasted for about forty-five minutes. After the dhamma talk members of the congregation made announcements, one concerning a ten-day retreat given by a Burmese meditation master, and another reminding people to replace ritual objects back on the altar after use. This simple pūja, reminiscent of the early closed Wesak celebrations previously mentioned in the Chapter on Sri Lanka, comprised the formal aspect of this Burmese Wesak. The informal component of this service consisted of a very casual question and answer period in the main shrine room. Most of the questions were posed by the four Caucasians present. While the monk was fielding questions the rest of the congregation was partaking in a potluck meal and informal conversation. There were no cultural performances to supplement the program. The ritual site for this Tibetan Wesak celebration is the same as for the Montreal Mini - Vesak. The ambience and decor were virtually identical except that a cushion was placed beneath the main altar reserved for the visiting Rinpoche. The Manjushri Center is an interesting example of the inter-cultural blending that occurs in pluralistic settings such as North America. Although it is a Tibetan temple, roughly half of the regular participants in the temple's activities are of Vietnamese descent. Approximately 150 people attended this Wesak celebration. The gender distribution was quite even with about one-third of the congregation under the age of thirty. There were twenty-five Caucasians present, mostly French speaking women. Many of the Tibetan men and women were dressed in traditional Tibetan attire, which lent an ethnic quality to the proceedings. The ceremony consisted of one and a half hours of chanting the “Prayer for Long Life” and the “Manjushri Praise”. Booklets were provided for those who could not recite from memory. Venerable Khen Rinpoche Lobsang Jamyang, the official abbot of the Manjushri Community of Montreal, who currently resides at Sera Monastery in India, led the chanting. The script was in Tibetan but was romanized for those who did not read the Tibetan script. Many of the participants had their own version, written in Tibetan, which they opened and handled with extreme care, never letting the book touch the ground. Handheld drums and finger cymbals occasionally punctuated the chanting. At one point during the service a sea conch was blown. Presumably this is a local innovation used in place of the Tibetan long horn since the sound was quite similar. After an hour of chanting, four Caucasian women, one Tibetan woman, and one Tibetan man handed out baskets and brown paper bags to receive blessed food in honor of the Hungry Ghosts. Wine and ground beef, described to me as "Food of the Buddha" by a Mexican Canadian who practices Tibetan Buddhism, were passed around the congregation. The ritual prescriptions for tasting this special food is to dip the third finger on the left hand into the wine and then take a pinch of the ground beef. This imbues the recipient with the blessing of felicity. A variety of foods were then handed out to be placed inside the paper bags and taken home to give to others who did not come to the service. The foods included apples, cookies, donuts, pretzels, croissants, onion rings, peaches, and fried bread. The purpose of the food is to bestow merit upon those who give it to others. According to Tibetan tradition, since Wesak is a particularly auspicious time of year each piece of food offered is the equivalent of offering 100,000 apples dedicated to the Buddha. After the food was distributed and the chanting had finished, people lined up to receive a white scarf blessing. Members of the congregation handed Khen Rinpoche a white scarf, bowed down and received a spoken blessing while Khen Rinpoche placed the scarf around their necks. This event signaled the culmination of the celebrations. Throughout the service the atmosphere was extremely casual. Children played in the back of the shrine room and people intermittently took breaks from the chanting to stretch their legs outside. Although the Mahāyāna celebration of the Buddha's Birthday only commemorates the birth of the Buddha, it is included here because it occurs at the same time of year, and its ritual content is similar to those found in a Wesak festival. The formal name of this Chinese Buddhist organization, the International Buddhist Progress Society (IBPS), is more commonly known as Buddha's Light International Association (BLIA). BLIA is the lay component originally formed by IBPS, the monastic community, in order to handle the business aspect of running a religious center. This includes acting as the intermediary between the organization and government officials, handling inquiries from interested lay people, and organizing different religious and cultural activities. Although this group belongs to the Mahāyāna tradition that traditionally celebrates the Buddha's birth, death, and enlightenment on three separate occasions, their "Buddha's Birthday" celebration contains many similar elements to those found in Wesak. The Buddha's Birthday is the closest Mahāyāna equivalent to a Wesak celebration. They celebrate the Buddha's enlightenment on the eighth day of the twelfth month (December), and while the Buddha's death is marked on the calendar as occurring on the fifteenth day of the second month there is generally no public ceremony to commemorate the event. Due to the large number of people who attend festivals such as the Buddha's Birthday, the festival took place in the basement of a community center on the outskirts of Chinatown in downtown Montreal (1001 St. Dominique). In previous years it had been held at a downtown Holiday Inn. The space, when not used for community events, serves as a school gymnasium, with a large stage at the end of the room closest to the entrance. The stage was flanked by two sets of short stairs on either side of the hall leading up to an altar at the back of the stage supporting a golden Buddha statue. On either side of this statue were two large vases of pink and white flowers and plates laden with oranges. At ground level, directly in front of the main stage was another table that supported a small bronze statue of the Buddha with one finger pointing to the sky and one to the ground, the classic depiction of the baby Buddha's claim to spiritual authority on earth and heaven. The statue of the baby Buddha was standing on a raised platform in the middle of a large bowl filled with water and flower petals to be used in the bathing of the Buddha component of the service. Surrounding this statue were tables containing potted flowers, and imitation carnations that had been offered to the Buddha prior to the commencement of the service. The seating arrangement was similar to that of a traditional Christian church, with wooden chairs arranged in rows often (wide) by 13 (deep), divided down the middle by an aisle wide enough for people to process down. The walls were adorned with advertisements for different kinds of vegetarian food, which could be exchanged for coupons purchased at the entrance to the hall. There was also a large painted mural hanging to the side of the main stage, depicting the birth of the Buddha in the Lumbinī Grove. The back of the hall was filled with tables selling, not only traditional Chinese food, but almost every item imaginable. Items of interest for sale were books on meditation, information about the founder and his ideas, tea, beads and amulets, incense that burned down to reveal a Buddha inside, Buddha purses, t-shirts and sweatshirts with Buddhist icons on the front, chinaware, and statues of Kuan Yin and other manifestations of the Buddha. In total there were probably close to one thousand people present at the celebration. There were no empty seats and a substantial number of people were standing along the walls and at the back of the hall. The atmosphere was characterized by a feeling of constant motion throughout the entire day. Donations were being made, food coupons were being sold, food stalls were being organized, costumes adjusted, and the constant buzz of excited conversation permeated the proceedings. The noise did not cease during a dhamma talk given by Venerable Man Hung, and was only overpowered during the chanting part of the schedule. The congregation present at the ceremony consisted of approximately 1000 people, of whom two-thirds were women and one-third men. There were a significant number of children who attended the service and later participated in the cultural performances. There were only a handful of Caucasians present. Within the assembly there were a variety of different uniforms and costumes, all representing a specific duty or office within the organization. An assortment of volunteers wore a yellow vest embroidered with the group insignia "BLIA" on the back. A handful of people dressed in brown robes who had taken the five precepts for the day, were helping Venerable Man Hung with the ritual elements of the service, such as playing the drum or bells. These were all women, except for one elderly man. Many of the audience members were dressed in colorful costumes in preparation for the cultural events planned for after the religious service. This added an exotic flavor to the celebration. The religious component of the service was preceded by a short business component. This included a presentation by the Montreal IBPS representative, Venerable Man Hung, to a delegate from the Taiwanese government who had donated a small satellite dish to the center. There were also various announcements concerning practical matters such as instructions on where to pick up flowers that had been offered to the Buddha, a summary of the upcoming schedule, and a request that people remain silent during certain parts of the service! The service commenced with the rhythmic banging of a drum and the chime of a bell. Venerable Man Hung, two brown-robed assistants, and four young men dressed as monks for upcoming cultural events, slowly processed to the front of the altar accompanied by ritual music and a welcome chant (Praise for the Incense Offering) followed by the chanting of the Heart sūtra. The chants (see list above) were not recited one after another, but were interspersed throughout the hour and a half service. All chanting was written in both Mandarin and English in the program. This was followed by a period of offerings to the Buddha. Incense and flowers were offered while the congregation recited "a call for blessings" on this ceremony, and an invitation for all the Buddhas to come and be present during the proceedings. The order of presentation seemed to begin with the more elderly members of the community, and those who had volunteered their organizational skills for the event. Eventually, the children came forward to offer precious items. Within Chinese Buddhism, there are ten (an auspicious number in the Chinese tradition) kinds of offerings generally presented to an image of the Buddha: food, fruit, incense, flowers, candles (light), tea, jewelry, pearls, clothing, and make-up. These are considered the basic kinds of offerings, but any offering is considered worthwhile if it contains meaning to the devotee. Next, there was a dhamma talk, given by Venerable Man Hung, on the Buddhist topics of emptiness, cause and effect (khamma), and the Middle Path. The talk was delivered in Mandarin translated into both French and English by a young member of the congregation. The ritual bathing of the Buddha followed the dhamma talk. People filed up to pour water on the shoulders of the statue of the baby Buddha using wooden ladles. It is considered inappropriate behaviour to pour any water on the head of the Buddha. This lasted approximately thirty minutes, and when most people had finished the schedule moved on. The table supporting the statue was moved to the side of the stage where people continued to bathe the Buddha throughout the remainder of the ceremony. Thus far, with the exception of bathing the Buddha, the itinerary was identical to the form followed every Sunday during the weekly service conducted at the center in Montreal. The entire religious component lasted about 2 hours. The only deviation was the lack of chanting and offerings for the sake of the ancestors, which is observed weekly at the temple. Also worked into the program was the offering of red roses to the participants in respect of Mother's Day that fell on the same weekend as the Buddha's birthday celebration. The cultural component began after a forty-five minute food break. The first two acts were women's choirs singing different songs with Buddhist themes. Next was a young teen who played a violin solo, followed by a Shaolin Kung-Fu demonstration performed by Caucasians who had studied in China. The final dramatizations were two plays re-enacting traditional Chinese Buddhist folk tales. All the characters were dressed in elaborate costumes, and had obviously put a lot of time and energy rehearsing their performances. The final segment of the Buddha's Birthday celebration took the form of a parade led by a traditional Chinese dragon dance (practiced in northern China predominantly). A small Toyota truck loaded with a huge drum beating out the rhythm for the dance followed the dragon. Next in line were volunteers carrying the statue of the baby Buddha on their shoulders. Following this float were members of the congregation sporting banners depicting scenes from the life of the Buddha, with captions explaining the scene. The procession wound its way through the streets of Chinatown, ending up back at the community center. The route covered approximately one kilometre, lasting about forty minutes. The IBPS members did not invite other Buddhist centers to this celebration. It seemed to be an event aimed at bringing members of the Chinese community in Montreal together. Ten members from this group also attended the mini-Wesak celebration held in Montreal. This section of the paper examines the adaptations that have occurred in the organization and performance of Wesak in North America. As in the case of Sri Lanka, transformations in North American Wesak celebrations simultaneously reflect and influence changes taking place in the Buddhist tradition. The method of identity consolidation for North American Buddhists is also through imitation of the western Other, this time represented by post-enlightenment ideals, such as secularism and pluralism, situated in a highly pluralistic social environment. This North American Buddhist transformation is characterized by the emergence of non-sectarian and ecumenical forms of Buddhist groups. Wesak provides a forum for viewing these changes and, in turn, through its annual re-enactment, effects a change within Buddhist identity. Secularism is one of the more salient challenges to the establishment of the Buddhist tradition in North America. At a rudimentary level, the term, "secularism", refers to "a social process by which religious worldviews and institutions give way to more scientific outlooks and this-worldly views" (Bell 198). This social process involves what some theorists have called "institutional differentiation", the different social systems i.e., religious, political, educational, economic etc., separate from one another and operate autonomously with varying degrees of dependence on one another (Bell 198). This lack of coherence is thought to result in social trends such as "the displacement of ritual... and the emergence of lay authority over clerical" (Bell 198). While the word secularism may conjure up images of a society without religion, it can in fact be a source of religious innovation. According to Bell, "secularization is neither a linear developmental process that spells the demise of religion nor a mere interpretive bias on the part of western scholars" (Bell 200). Instead, it is a process that occurs when different cultures, each with a unique value system and form of social organization, encounter each other. The introduction of Buddhism into the secular context of North America has forced Buddhism to adapt to this secular perspective. One way in which Buddhists have had to adapt to the secular setting of North America concerns the practical consideration of determining the date for Wesak. Although it may seem straightforward to celebrate a certain festival on a prescribed day, many contradictory variables affect the exact date of a Wesak celebration from year to year and place to place. Not only is there the problem of trying to synchronize the prescriptions of the old lunar calendar with the more internationally recognized Gregorian calendar, but local considerations also play an important part in organizing this event. In North America, the considerations in setting a date for a Wesak festival reflect the different kinds of issues that will alter the shape of a distinctly North American Buddhist identity. One of the most obvious factors is that Buddhism is a minority religion, and therefore does not warrant a Canadian or American national holiday to honour its founder. Also, the increasing number of Wesak celebrations organized by pan- Buddhist groups complicates the organizational challenges of any festival preparation. Given their minority religious status, and the secular nature of North American society, Buddhists must plan around other secular events taking place within a city. As a result, Wesak festivals are scheduled around the regular five-day workweek and fall on the weekend closest to the actual date. As a minority religious presence, one of the more prevalent ways in which Buddhists have responded to the challenges presented by the dominant cultural climate of the North American Other, i.e., secularism, is to combine their separate group identities into one collective identity via pan-Buddhist organizations. These urban Buddhist phenomena are formal organizations centered in a city, bringing together a variety of ethnic and occidental Buddhists who, despite traditional barriers, cooperate to organize co-religious events such as the Wesak festival. Although, such coalitions are not exclusively North American, they are a prominent characteristic of North American Buddhism24 (see Appendix 8). The formation of these groups reflects one of the most rudimentary forms of identity consolidation: forming groups to achieve a common cause. The goal, simply put, is to create a distinctively Buddhist presence in North America. Wesak celebrations provide the necessary impetus for the creation of these pan-Buddhist organizations, which, in turn, have led to the development of multi-denominational Wesak rituals. Rituals such as Wesak define power in two ways: "first, they use symbols and symbolic action to depict a group of people as a coherent and ordered community based on shared values and goals; second, they demonstrate the legitimacy of these values and order of the cosmos" (Bell 129). Just as symbolic entities, such as governments, allow a varied group of people to be thought of as a single entity, the creation of pan-Buddhist organizations enhances Buddhist claims to social legitimacy. One way in which political rituals, such as Wesak, define Buddhist communities is through symbolic displays. Wesak is an effective tool because "organizations can only be 'seen' through their symbolic representation; ritual provides the means by which such images are created and through which people are identified with them" (Kertzer 87). In a Buddhist paradigm, through symbolic displays, rituals provide the means whereby Buddhists communally identify with each other. The symbolic displays commonly found at any Wesak celebration, such as Buddhist flags, statues of the Buddha, the recitation of familiar chants, etc. are all ways of bringing the individuals into the community and establishing a social entity. From the perspective of the outsider, or Other, Buddhists are identified through this symbolic representation. One way in which Wesak promotes social legitimation for Buddhists in North America is through endorsements (usually included in the Wesak program itself) for Buddhist celebrations from local and national politicians. The presence of the Thai Ambassador at the BCM Wesak held at Wat Dhammaram is one example of such social legitimation. Another good example can be gleaned from the program of the 1999 Buddhist Celebration for World Peace (a Wesak celebration organized by sangha members) held in Toronto. Inside the program booklet were endorsements from the Mayor of Toronto, Mel Lastman; the Minister of Citizenship, Culture and Recreation, Isabel Basett; the Premier of Ontario, Michael D. Harris; and from Prime Minister Jean Chretien (see Appendix 9). These advertisements demonstrate to Buddhists, and the interested public, that this ritual celebration and the tradition it represents, is a politically acceptable and legitimate group belonging to the larger society. Due to the highly multi-cultural nature of the North American religious environment, Buddhists tend to adopt a pluralist model in addressing common concerns as a minority religious presence. This means that the diversity of each particular Buddhist group is considered to be important. Throughout North America, the inter-Buddhist associations or pan-Buddhist groups, try to incorporate "respect and appreciation for the uniqueness of each Buddhist group, with agreement upon commonly held concerns as a basis for unity" (Numrich 1999, 127). Pan-Buddhist organizations are run through the collaborative efforts of all the associated centers. With such a multi-cultural group, the only way to actualize co-sponsorship of an event such as Wesak is to allow for as much representation from each group as possible. Consequently, following a mandate of unity in diversity, the formal component of most pan-Buddhist celebrations includes aspects of all three main Buddhist traditions. For example, during the formal part of the mini-Wesak service observed in Montreal, chanting was conducted in Tibetan, Chinese and Pāli, representing all three main Buddhist traditions. The Bodhisattva Aspiration, the Transfer of Merit, and the Bathing of the Buddha (Kambutsu in Japanese) were included out of respect for the Mahāyāna tradition. The Tibetan chanting represented the Vajrayāna tradition, and a Bangladesh monk performed the final blessing in Pāli for the sake of the Theravāda adherents. The dramatic component of Wesak also reflects this collective concern for mutually honouring distinctiveness. Cultural performances at the BCM Wesak ranged from a Japanese Taiko drum group to Miss Thailand World performing with a top hat and cane. This pluralistic mandate is expressed in the song "Roll the Dharma Wheel" written by a Sinhalese monk, Bhante Punnaji, and sung by Toronto Buddhist musician, Brent Titcomb at a variety of Wesak events. The title and lyrics of the song, emphasizing nonsectarian attitudes towards Buddhists of different sects, reflect the ecumenical nature of Wesak celebrations in Toronto and in North America in general. The dominance of the Judeo-Christian tradition and the fact that virtually every school of Buddhism represented in North America have required Buddhists to adapt to this overwhelmingly pluralistic setting by cultivating cooperation between the various Buddhist groups. In response to North America's pluralistic nature, Buddhists have found it necessary to foster an ecumenical attitude towards other Buddhists and those of different religious traditions. In order to strengthen their socio-cultural status, it is not uncommon to find Mahāyāna Buddhists celebrating alongside Theravādins at a Wesak ceremony. This kind of multi-denominational event requires that all traditions be fairly represented in terms of ritual content. Consequently, despite Wesak's Theravāda roots, one popular ritual element that seems to have been adopted as a permanent fixture at inter-Buddhist Wesak rituals is the Mahāyāna tradition of "Bathing the Buddha".25 Within the Mahāyāna tradition, this rite is performed in honour of the Buddha's birthday. In fact, from the Wesak celebrations, I observed that there seems to be little functional difference between the North American pan-Buddhist Wesak celebrations and the Mahāyāna celebration of the Buddha's birthday. In its eastern context, the most obvious similarity between the Theravāda Wesak and the Mahāyāna Buddha's birthday celebrations is that they occur at the same time of year. In Mahāyāna countries such as Korea, China, Taiwan, Japan, and Vietnam, the three seminal events in the life of the Buddha are celebrated on separate occasions. The Buddha's birth is celebrated on April 8, the enlightenment on December 8, and the parinibbāna, or death, on February 15 (Gombrich 1986, 57). The "Bathing of the Buddha" is the climactic activity within the religious service through its involvement of the entire congregation.26 The entire lay congregation participates in the ritual bathing, which is usually followed by an informal component which involves eating, singing and dancing. This form of Wesak celebration certainly deviates from the traditionally austere practices associated with the conservative Theravāda tradition. It also reflects the emerging ecumenical Buddhism that the broader North American context necessitates for the survival of a religious minority. The pluralistic and competitive nature of North American society has precipitated a blending of Buddhist traditions in order to adapt to the demands of particularly the "occidental" or "white" Buddhists. Wesak has become an event not only for groups representing the three traditional divisions of Buddhism, but also for the new North American forms of Buddhism. Many of these groups incorporate elements of the western Other into their basic structure and tenets. For instance, a non-sectarian brand of Buddhism is becoming popular in America. An example of this is Chicago's Heartland Sangha. Founded in 1989, and affiliated with the American Buddhist Association, it professes to practice a non-dualistic, pan-sectarian Buddhism "drawn from the original teachings of Gautama Buddha, Jodo Shinshu, Zen Buddhism, and Engaged Buddhism" (Heartland Sangha Notes 20). There is an overwhelming emphasis on the ideal of oneness: "To us, recognition of differences is a way of Oneness. We don't have to expect to be the same as others, but we can make an effort to see the differences and acknowledge and respect differences and then, we can be united" (Ibid.). The diversity of Buddhists is evident in the number of non-traditional groups that combine Theravāda, Mahāyāna and Vajrayāna beliefs and practices. These include groups such as Friends of the Western Buddhist Order (FWBO). McLelland asserts that participants in these non-traditional groups are "primarily Caucasians from a Judeo-Christian background, who actively pursue Buddhist meditation", and also college and university students and teachers "interested in Buddhism, both from an academic and a participatory perspective" (McLelland 12).27 The Tibetan Manjushri temple in Montreal, half of whose membership is Vietnamese, reveals that such blurring of traditional lines is not confined to Caucasian converts to Buddhism. In addition, there are lay teachers, such as Toni Packard, who runs the Springwater (retreat) Center near Buffalo, New York, who refuse to identify themselves as Buddhists although they have received specifically Buddhist training. While many of these new Buddhist groups do not participate in the actual Wesak ritual (probably due to a certain skepticism of "ritualism" associated with Buddhism in Asia), attending the festival affords them an opportunity to interact with other Buddhist groups and introduce themselves to the wider public. The Chicago Wesak organized by the BCM provides a glimpse into the variety of different Buddhist traditions that compete for a wider audience alongside the more traditional schools. Many of the Centers that did not send representatives to the religious service conducted earlier that morning at Wat Dhammaram used the festival to advertise their own Wesak or Buddha's Birthday celebrations. Some Centers, such as the Chicago Insight Meditation Center, handed out literature from a variety of sources. There was the bi-annual newsletter from the North American Headquarters for Vipassana Meditation located in Barre, Massachusetts, a newsletter published by the Heartland Sangha entitled "American Buddhist Newsletter", which contained articles written by authors belonging to the Zen, Tibetan, and Vietnamese traditions. They also distributed a newsletter called "Oneness". There was also one messianic organization present whose only apparent connection to Buddhism is their use of the name of Maitreya, who, in Buddhist lore, is designated as the next Buddha.28 The eclectic mix of groups gathered together at the Chicago Wesak celebration reflects the syncretic blending of religious and ethnic traditions that is a growing phenomenon in North American Buddhism. At the same time, the fact that some groups refused to participate in the formal aspect of the Chicago Wesak, and chose only to set up tables for self-promotion, reflects the ethnic divisions that persist among North American Buddhists. For instance, the congregation for the formal component of the Chicago Wesak was predominantly comprised of Asian-Americans, while Euro-Americans, representing mainly non-sectarian groups, were the main participants in the stall advertising that followed the main service. Although Wesak provides a forum for these otherwise separate groups to interact, it would seem that Wesak is primarily an event for Asian-American Buddhists. Euro-American Buddhists, who obviously acknowledge the advantages of public gatherings with other Buddhists, are generally less interested in the ritualism and "cultural trappings" associated with traditional Buddhism, and have to create their own co-religious events that are more conducive to their particular needs. "Ethnicity determines not only the composition of members but also the activities of the group" (Tanaka 287). Besides allowing new forms of Buddhism to be displayed in a public arena, the celebration of Wesak has also spawned the conception of other co- religious events, such as "Change Your Mind Day" (CYM Day) sponsored by the Buddhist review magazine, Tricycle.29 CYM Day, which has been held in New York City's Central Park for the last seven years, is an example of an event oriented particularly towards Euro-American Buddhists. This event is continually growing in size and is rapidly becoming a tradition of its own. Two years ago, CYM Day branched out to include celebrations in San Francisco; Anchorage; Alaska; Kansas City; Williamsport, Pennsylvania; and Montoursville, Pennsylvania. This year it spread even further to include Austin, Texas; Seattle; Washington; and a satellite CYM Day, focusing on music, was held in Vancouver, B.C. (Tricycle, Fall 2000, 14-15). The intent of this event is also very similar to that of Wesak. Organized by the magazine's board, their statement of purpose in organizing a "day of free Buddhist meditation" is to "reach out to the community, making dharma more accessible, and bringing together members of different sangha" (Tricycle, Fall 2000, 14). This event mirrors the official intent of almost every other pan-Buddhist lay organization or event in existence. What has inevitably happened is that this multi-cultural, multi-ethnic, and multi- religious environment has grown to include a variety of cultural events that are associated with the different Buddhist traditions. For example, most Wesak celebrations organized by pan-Buddhist groups include a cultural component comprised of singing, dancing, and other forms of artistic expression that have arisen in the countries that Buddhism has touched. CYM Day includes, besides different meditative techniques, demonstrations of T'ai Chi, Qi Gong, Zen archery, and musical performances using Zen drums and Tibetan long horn instruments. While these dramatic elements add depth and colour to the ritual proceedings, as well as legitimating new ritual traditions by associating them with the ancient customs of other Buddhist cultures, the main focus of the CYM Day activities remains spiritual teachings and meditation instruction. This is communicated through a series of lectures from various lay and ordained teachers. The intention, to bring different Buddhists together and disseminate the Dharma to a wider public, may represent common ground for Wesak and CYM Day, but the ethnic differences that exist between Asian and Euro-American Buddhists have spawned the creation of a parallel practice. White Buddhists have created a tradition of their own in order to make Buddhism, essentially a foreign religion, a familiar and distinctly North American tradition. CYM Day, or "White Wesak", reflects the existence of parallel Buddhist communities in North American Buddhism. Ethnicity refers "to te recognition of two distinct and mutually isolated brands of Buddhism practiced by groups composed largely of Asian Americans, on one hand, and Euro-Americans, on the other" (Tanaka 287). In terms of practice, Euro-American, Buddhists tend to focus mostly on meditation, e.g., Vipassana (See FronsdaI163-180), and chanting e.g., Soka Gakkai. On the other hand, Asian Amencans are more likely to Incorporate Informal elements, which might Include traditional dancing and musical accompaniment, into their form of practice. Paul Numrich uses the term "parallel congregations" to illustrate the dynamics that evolve when both ethnic groups are affiliated with the same temple or group. Within his case study of Wat Dhammaram, a Theravāda temple located in Chicago, Numrich describes how the two congregations "intersect" at certain events but do not "interact" (Numrich 1996,63-65). Wesak, as well as certain meditation-centered events such as classes and retreats provide one of the few opportunities for interaction between the groups. When the two congregations do not intersect but remain parallel, conflict between tradition and interpretation remains minimal. Through the creation of pan-Buddhist groups, which are formed primarily for the purpose of organizing Wesak celebrations, opportunity for intersection increases. The Buddhist response to North American influences such as pluralism and secularism has been adaptation. The creation of pan-Buddhist groups is an example of this adaptation. They represent an ecumenical approach to problems such as feelings of isolation and powerlessness, encountered by minority groups in a pluralistic setting. Through cooperation and inter-faith dialogue (with Christians as well) Buddhists are capable of organizing large-scale events such as the BCM Wesak, which not only enhance mutual understanding between different Buddhists but also announce their presence to the wider public. These symbolic acts create a very real sense of purpose and identity for Buddhists. Issues of ethnicity and the existence of parallel congregations does not detract from the fact that ecumenism is a growing trend in North American Buddhism. Inevitably divisions will persist but the consolidation of identity does not depend on unanimous agreement amongst all of the Buddhist groups; it only requires the participants to respect the diversity that already exists. Throughout this thesis, the Wesak ritual has been examined in terms of its socio- historical function as a consolidator of a collective Buddhist identity. This function has come about primarily through a dynamic of imitation of the Other. In Chapter Two, the Other is manifested through the incorporation of indigenous practices into Wesak's ritual content. The possibility of Indian and agricultural influences upon Wesak illuminates the syncretic nature of ritual development and its adaptability in the face of cultural and political changes. In the case of Sri Lanka, the Other is the colonial package comprised of Christianity and western European pedagogical techniques, whereas in North America the Other is represented by secular and pluralistic western political ideals. One can conclude from the resulting variety of Wesak rituals celebrated in different parts of the world, that no original or pristine form of Wesak exists, or has ever existed. Instead, due to constantly shifting socio-political environments, there is only a changing ritual fonn designated as the Buddhist ritual Wesak. Ritual continuity is maintained through commemoration of the life of the Buddha and, paradoxically, through the syncretic blending of Buddhist culture with that of the Other. Wesak has also been used as a political tool for identity consolidation when tension arises due to cultural and political overlap. Wesak has functioned as a vehicle for the transformation that occurs in response to the challenges proffered by encounters between Buddhism and western ideals. This in turn consolidates identity for the Buddhist community, a minority presence in both Sri Lanka and North America. For instance, the Christian influence upon Wesak festivities in Sri Lanka offers an excellent example of how incorporation of western social practices and festivals have helped to forge a distinctly Buddhist identity. This has resulted in parallel practices to such an extent that the contemporary celebration of Wesak in Sri Lanka has been designated as "A Buddhist Christmas". In Sri Lanka, such syncretic Wesak celebrations have been instrumental in facilitating a resurgence in the popularity of Buddhist practices. Western values such as secularism and pluralism have prompted Buddhists of different sects to foster cooperative approaches to ensure the survival of Buddhism in North America. The creation of pan-Buddhist groups, sometimes formed specifically for the purpose of organizing Wesak celebrations, has provided the necessary organizational structure for Wesak to be celebrated annually. The inter-sectarian cooperation encouraged through the organization of a Pan-Buddhist Wesak celebration also functions to instill a framework for the centralization of Buddhist communities. In Toronto, an example of such collaboration resulted in the formation of the Toronto Buddhist Federation in 1980, the first pan-Buddhist group in Canada, possibly in North America. Subsequently this also led to the creation of a Buddhist directory with a list of contact names and numbers for the different Centres. Wesak functions as a means of communication between different Buddhist groups and also the wider non-Buddhist public. Individual groups participate in co-religious events because they are occasions to identify with other Buddhists by expressing a common allegiance to the Buddhist tradition. But Wesak's social function goes deeper than this. Once it is understood that "rites create political reality" (Kertzer 1), a picture emerges of Wesak as a Buddhist ritual that has the potential to transform the very fabric of Buddhist identity, while also serving as a source of religo-cultural continuity, whether it be in Sri Lanka or Toronto. Through the ritual display of specific symbols, identity is confirmed; it is further entrenched through ritual repetition as in the case of annual Wesak celebrations. This process of identity consolidation works both ways. As Hori points out, "In the long slow process of acculturation, the host culture and the guest religion change each other" (Hori 1998, 77). The ecumenical nature of Wesak, characterized by the inclusion of a variety of different Buddhist groups and a high level of lay involvement, also affects the wider Buddhist population in terms of how they choose to define themselves. By participating in the ecumenical North American Wesak celebrations, Buddhists are consciously acknowledging the transformation of their tradition. It is the innovatory potential of ritual that makes it such a "potent force in political change" (Kertzer 12). Theories of system-makers will perish there. I would like to thank my supervisor, Professor Victor Hori, for his unconventional means of support throughout the extensive period that comprised my thesis experience. I would also like to thank Professors Heidi and Dan for the loan of their considerable inspiration and my “Best Buddy” Els for providing the conceptual origins of this thesis. And last but not least, a huge thank you to Ella who helped to remind me, and continues to remind me, that there is more to life than reading and writing. Without all of these veritable pillars of support this thesis would not have been possible. 1 Throughout this paper, as much as possible, terms such as parinibbāna and Theravāda will be rendered in the original source language, Pāli. The term Veśākha, is the Sanskrit term for the second month in the Indian calendar. 2 This term, used by Paul Numrich in an article entitled "Local Inter-Buddhist Associations in North America" (1999), denotes the phenomenon xof events such as Wesak that are organized through the cooperation of many different kinds of Buddhist groups. 3 The ritual proceedings were videotaped using a hand-held Hi-8 video recorder. 4 These accounts are compiled in works such as Culture of Ceylon in Mediaeval Times by Wilhelm Geiger, and Buddhism: Beliefs and Practices by Lynn De Silva. 5 See these works: Theravāda Buddhism in Southeast Asia by Robert C. Lester, Buddhism and Society in Southeast Asia by Donald Swearer, and World Conquerer and World Renouncer by S.J. Tambiah. 6 Numrich broadly defines "Americanization" as the "adaptation of nonindigenous religious traditions to an American context" (Numrich 1996, 140). According to Numrich, an example of this process of cultural adaptation can be found in the "[l]aicization and voluntaryism" of immigrant religions in America (Numrich 1996, 142). 7 A glaring example of this problem arose during research of the Burmese Wesak in Vancouver. First of all, there was an initial language barrier between myself and the Burmese-speaking monk, whose heavily accented, softly spoken broken English was difficult to understand. I had visited the temple a few days prior to Wesak in order to familiarize myself with the environment and to make sure it would not be intrusive for me to attend the service. I was told that it would be fine if I attended the Wesak ceremony, and that the service started at noon. The actual starting time of the service was 11 a.m. Both parties knew the difference between 11 and 12 o'clock. The fact that I was told a different starting time either indicates that there was a change in the schedule, or time means something else to Southeast Asian cultures. 8 For instance, at the Chicago Wesak, a lay representative from one of the Buddhist groups got quite angry with me and walked away thinking that I was a reporter of some kind; and I suppose I was. 9 Vows to abstain from killing, stealing, sexual misconduct, lying, and the use of intoxicants. 1O The figure of the Buddha, his Teachings, and his Community of followers. 11 Activities often include dramatic reenactments of the Buddha's life, accompanied by traditional ethnic songs and dance performances. 12 There is no biography of the Buddha in the Pāli Canon, the oldest collection of Buddhist literature, but the beginnings of one can be found in the Suttapitaka and the Mahāparinibbana Sūtra (Khosla xi). 13 Aśoka's Rock Edicts, of which 30 have been identified in India and Afghanistan since 1873, are carved from polished stone or sandstone and depict mainly Buddhist teachings (Hirakawa 97). 14 Other examples of the blending of popular and more traditionally Buddhist practices found in Wesak celebrations in Southeast Asian countries such as Myanmar, where the watering of pipal trees (otherwise known as Bodhi trees) is a part of the ritual. In Thailand, Laos, and Cambodia, Buddhists circumambulate around an image of the Buddha carrying lighted candles and incense to honour the founder of their tradition (Lester 143-144). Other activities associated with Wesak celebrations may include any of the following: releasing caged animals and offering prayers, "watering Bodhi trees within monastery compounds, circumambulation of the cetiya reliquary at night with incense and candles, acts of social service such as feeding the poor and treating the sick in hospitals, pilgrimage to sacred sites, and the bathing of the Buddha images" (Swearer 1987, 548). 15 The term "New Age" is used rather loosely in the scope of this section, since Buddhism, until recently, was also classified as a New Age movement. 16 In this context, "dhamma" refers to the "truth", or "teachings" imparted by the Buddha. 17 The use of the term "myth" does not connote a lack of respect for the material at hand, nor discount the possibility that (although unlikely), the dhammadīpa myth is historically accurate. It only serves to emphasize the liberal approach applied by the authors of the Chronicles in their attempt to compile a religious, as opposed to an objective, history of Sri Lanka. 18 The contents of the myth are revealed in the "Ceylonese Chronicles": the Dīpavamsa, written between the beginning of the fourth century and the first third of the fifth century CE (Clifford 39); the Mahāvamsa (sixth century CE); and the Culavamsa (thirteenth century CE). Covering a period of approximately 1500 years, these mytho-historical texts are not so much concerned with an accurate rendering of Sinhalese history, but rather they emphasize the sacred history of the Sinhalese people and their identity as Buddhists. These historical narratives are constructed "around certain archetypal personages or events" (Greenwald 14) which serve to legitimate the unique historical connection between Sinhalese culture and the Buddhist tradition. In fact, these Chronicles record "the sacred history of a people destined with a sacred mission, namely, to maintain the purity of the Dhamma in a world of impermanence and self-seeking" (Smith 32). 19 The "colonial package" refers to the host of social influences that accompanied the colonial presence on the island of Sri Lanka. For instance, increased levels of education, urbanization, and the introduction of Christianity as the state religion. Many Sinhalese Buddhists converted to Christianity in order to increase their social prestige. 20 Colonel Henry Steele Olcott was an American who, along with Madame Blavatsky, organized the Theosophical Society in 1875. He landed in Sri Lanka on 17 February 1875 (a day once celebrated as "Olcott Day" in Independent Sri Lanka) and proceeded to form the Buddhist Theosophical Society. He was influential in promoting a Buddhist revival in Sri Lanka (Fields 62). 21 The term "Protestant Buddhism" was coined by Gananath Obeyesekere in the article "Religious Symbolism and Political Change in Ceylon". Used first to describe a protest movement against the Protestant Christian missionaries, the term actually denotes the adoption of important features of Protestantism by Sinhalese Buddhists. 22 In his article, Sugunasiri describes these "final wave" immigrants as "either businessmen attracted by the Canadian government's new initiative of encouraging entrepreneurs with money to invest, or professionals (e.g. bankers) and skilled personnel, educated in English under a British system, qualifying under the independent category" (Sugunasiri 85). 23 The Chinese Buddhist organization, International Buddhist Progress Society (IBPS) is more commonly known as Buddha's Light International Association (BLIA). IBPS refers to the monastic component of this organization while BLIA represents the lay element. 24 According to an anecdotal source in Toronto, the first pan-Buddhist group was possibly formed in Malaysia by Ven. Dr. K. Sri Dhammanada Mahā Nayaka Thera as early as 1953 (Janet McLellan, July 31,2000). 25 The ritual observance of Bathing of the Buddha is widely practiced in countries where Mahāyāna Buddhism is practiced, such as China, Japan, Vietnam and Korea. As a ritual practice it finds scriptural precedence in the stories surrounding the birth of the Buddha in a grove of sāll trees called the Lumbini garden (Bapat 20). It is derived from early accounts of the washing of the baby Buddha and his mother at birth. For example, one account described in the Lalitavistara depicts "two nāga serpents, Nanda and Upananda, bathing the bodhisattva after his birth" (Swearer 1987, 549). Another version mentioned in the Mahāsattva Sūtra describes how the newborn was "bathed by Indra and the four deva kings" (Swearer 1987, 549). This last account is elaborated upon in yet another early text which records the baby Buddha exiting from his mother's womb and being cleansed as "two streams of water fall from the sky, one cold and one hot, wherewith they (the four gods) perform the washing for the Bodhisatta and his mother" (Acchariyabbhutadhamma-sutta, Majjh., iii, 118, cited in Thomas 31). The Mahāsattva Sūtra also "designates the eighth day of the fourth lunar month as the time when all devotees should wash his [the Buddha's] images in respect of the Buddha's power to grant boons" (Swearer 1987, 549). 26 The ritual activity focuses on a small statue of the baby Buddha in his defining posture, with one hand pointed towards the sky and one pointed towards the ground. This pose, mentioned in the Pathamasamphoti text depicts the baby Buddha as "superior to the gods [in the sky] for they serve him [...] [and] the goddess of the earth for she testifies to his reigning virtue" (Swearer 1976, 45-46). The water is ceremonially poured over the body of the baby Buddha, standing on a platform in the middle of a large bowl or basin filled with water, using a wooden ladle. This ritual action denotes respect for the Buddha and also represents the washing away of one's own impurities. 27 McLelland provides a list, compiled in 1988, of a variety of different Buddhist groups in her book, see pp.221-223. 28 Originally a Mahāyāna conception, according to Buddhist tradition recounted in the Jātaka Tales, the "historical" Buddha, Siddhatha Gautama, was only the latest incarnation in a successive line of beings who achieved Buddha-hood. Maitreya is the name given to the next being to achieve Buddha-hood. 29 Another such event is the "Buddhist Fair", first organized by the Buddhist Association of Southwest Michigan in 1997. 30 These two terms are attributed to Thomas Tweed (1992). Achan Chuen Phangcham. Personal correspondence; June, 15,2001. Bailey, Alice A. The Unfinished Autobiography. New York, New York: Lucis Publishing Company, 1951. Bailey, Alice A. The Wesak Festival: A Technique of Spiritual Contact. New York, New York: Lucis Publishing Company, 1951. Bakker, J. W.M. "Contemporary Buddhism in Indonesia." In Buddhism in the Modern World. Ed. Heinrich Domoulin and John C. Maraldo. New York, New York: Macmillan Publishing Co., Inc, 1976, pp. 147-153. Balbo Elementary School. "Festivals and World Religions". Accessed March 8, 2001. Available from http:/ /www .kI2.nf.ca/balbo/grassroots/Religion/Wesakcelebration.html. Bapat, P.V. 2500 Years of Buddhism. Delhi, India: Government of India, Publications Division, 1956. Bapat, Tara. Rituals and Festivals of India. India: Popular Prakshan Pvt. Ltd., 1991. Bechert, Heinz. "The Beginnings of Buddhist Historiography: Mahāvamsa and Political Thinking". In Religion and Legitimation of Power in Sri Lanka. Ed. Bardwell E. Smith. Chambersburg. PA: Anima Books, 1978, pp.I-12. Bell, Catherine. Ritual: Perspectives and Dimensions. New York, New York: Oxford University Press, 1997. Buddhist Annual of Ceylon (2514). Colombo, Sri Lanka: W.E. Bastion, 1970. Buddhist Council of New South Wales. "Its Past, Present an Future". Accessed March 5, 2001. Available from http://www.budhist council.org/bcgrnd.htm. Buddhist Federation of Toronto, Wesak Pamphlet, 1992. Clifford, Regina T. "The Dharnrnadipa Tradition of Sri Lanka: Three Models within the Sinhalese Chronicles". In Religion and Legitimation of Power in Sri Lanka. Ed. Bardwell E. Smith. Chambersburg. PA: Anima Books, 1978,36-47. De Silva, Lynn A. Buddhism: Beliefs and Practices in Sri Lanka. Colombo, Sri Lanka: . Wesley Press, 1974. Disanayaka, J.B. Introducing Sri Lankan Culture: The Vesak Fullmoon Festival. London: Pioneer Lanka Publications, 1993. Durkheim, Emile. The Elementary Forms of the Religious Life. Trans. Joseph Ward Swain. New York: The Free Press, 1965. Dutt, Sukumar. Buddhist Monks and Monasteries of India. London, U.K.: Allen and Unwin Ltd., 1962. Fields, Rick. How The Swans Came To The Lake. 3rd ed. Boston, Mass. : Shambhala Publications, Inc., 1992. Fields, Rick. "Divided Dharma: White Buddhists, Ethnic Buddhists, and Racism." In The Faces of Buddhism in America. Ed. Charles S. Prebish and Kenneth K. Tanaka. Los Angeles and Berkeley: University of California Press, 1988, pp. 196-206. Geiger, Wilhelm. Culture of Ceylon in Mediaeval Times. Ed. Heinz Bechert. Germany: Otto Harrassowitz, 1960. Gombrich, Richard, F. "Buddhist Festivals." In Festivals in World Religions. Ed. Allan Brown. Great Britain: Longman Group Limited, 1986, pp. 31- 59. Gombrich, Richard and Gananath Obeyesekere. Buddhism Transformed: Religious Changes in Sri Lanka. Princeton, N.J.: Princeton University Press, 1988. Gombrich, Richard, F. Buddhist Precept and Practice: Traditional Buddhism in the Rural Highlands of Ceylon. Revised ed. London: Kegan Paul InternatIonal, 1995. Greenwald, Alice. "The Relic of the Spear: Histiography and the Saga of Duttagāmanī. In Religion and Legitimation of Power in Sri Lanka. Ed. Bardwell E. Smith. Chambersburg. PA: Anima Books, 1978, 13-25. Hayes, Richard. E-mail regarding "Lunar Cycles", Thursday August 31, 2000. Heartland Sangha Notes: American Buddhist Newsletter. "What is 'Heartland Sangha'?" Spring 00, Vol.6 No.1. Hirakawa, Akira. A History of Indian Buddhism. Trans. Paul Groner. Honolulu: University of Hawaii Press, 1990. Hori, G. Victor Sogen. "Japanese Zen in America: Americanizing the Face in the Mirror ." In The Faces of Buddhism in America. Ed. Charles S. Prebish and Kenneth K. Tanaka. Los Angeles and Berkeley: University of California Press, 1998, pp. 49-78. Hori, G. Victor Sogen. Personal correspondence, August 15,2001. Jackson, Peter A. Buddhism, Legitimation, and Conflict: The Political Functions of Urban Thai Buddhism. Singapore: Institute of Southeast Asian Studies, 1989. Jary, David & Jary, Julia. The Harper Collins Dictionary of Sociology. U.S.A.: Harper Collins Publishers Ltd., 1991. Jayatilleke, K. N. The Message of the Buddha. Ed. By Ninian Smart. London: George Allen and Unwin Ltd., 1975. Kenadi, L. Revival of Buddhism in Modern India: The Role of B.R. Ambedkar and the Dalai Lama XIV: New Delhi, India: Ashish Publishing House. Kertzer David I. Rituals, Politics and Power. Yale, Conneticut: Yale University Press, 1988. Khosla, Sarla DR. Lalitavistara and the Evolution of the Buddha Legend. New Delhi: Galaxy Publications, 1991. Lester, Robert C. Theravada Buddhism in Southeast Asia. Ann Arbor, Michigan: The University of Michigan Press, 1973. Ling, Trevor. Buddhism and the Mythology of Evil: A Study in Theravada Buddhism. London, UK: Allen and Unwin Ltd. 1962. Ling, Trevor. Buddhism, Imperialism, and War. London, UK: George Allen and Unwin Ltd., 1979. Lukes, Stephen. Émile Durkheim: His Life and Work: A Historical and Critical Study. New York: Penguin, 1977. Malalgoda, Kitsiri. Buddhism in Sinhalese Society, 1750-1900: A Study of Revival and Change. Berkeley: University of California Press, 1976. Maurer, Walter Harding. The Sanskrit Language: An Introductory Grammar and Reader. Vol. 1 Richmond, Surrey: Curzon Press, 1995, pp. 529-530. Matsunaga, Alicia. The Buddhist Philosophy of Assimilation: The Historical Development of the Honji-Suijaku Theory. Tokyo, Japan: Charles E. Tuttle Company, 1969. McLellan, Janet. Many Petals of the Lotus: Five Asian Buddhist Communities in Toronto. Toronto: University of Toronto Press, 1999. McLellan, Janet. Personal correspondence; July 31, 2001. Nattier, Jan. "Who is a Buddhist? Charting the Landscape of Buddhist America." In The Faces of Buddhism in America. Ed. Charles S. Prebish and Kenneth K. Tanaka. Los Angeles and Berkeley: University of California Press, 1998, pp. 183-195. Numrich, Paul David. Old Wisdom in the New World: Americanization in Two Immigrant. Theravada Buddhist Temples. Knoxville, Tennessee: The University of Tennessee Press, 1996. Numrich, Paul David. "Theravada Buddhism in America: Prospects for the Sangha". In The Faces of Buddhism in America. Ed. Charles S. Prebish and Kenneth K. Tanaka. Los Angeles and Berkeley: University of California, 1998, pp. 147-161. Numrich, Paul David. "Local Buddhist Associations in North America. " In American Buddhism. Ed. Christopher S. Queen and Duncan Ryuken Williams. Richmond, Surrey: Curzon Press, 1999, pp. 117- 142. Oldenberg, Hermann. Buddha: His Life, His Doctrine, His Order. London: Williams and Norgate, 1882. Prebish, Charles S. and Tanaka, Kenneth K. eds. The Faces of Buddhism in America. Berkeley and Los Angeles, California: University of California Press, 1998. Prothero, Stephen. The White Buddhist: The Asian Odyssey of Henry Steel Olcott. Indianapolis, Indiana: Indiana University Press, 1996. Rahula, Walpola. History of Buddhism in Ceylon. Colombo, Sri Lanka: M.D. Gunasena & Co., 1956. Sangha Council of Ontario Buddhist Ministry. 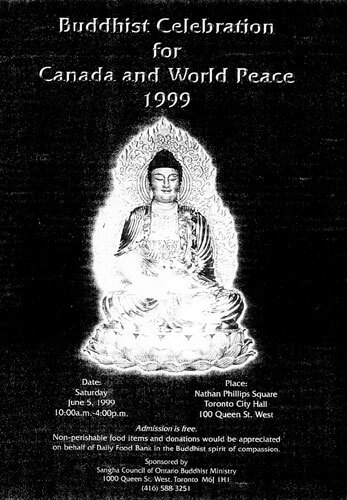 Program for the Buddhist Celebration for Canada and World Peace 1999. (Appendix 9). Sarao, K. T. S. "Background to the Origin of Buddhism. "In A Text Book of the History of Theravada Buddhism. Ed. K.T.S. Sarao. Delhi: Jayyed Press, 1995, pp. 15-28. Sharma, Anita. "India at the Time of the Birth of Buddhism. " In A Text Book of the History of Theravada Buddhism. Ed. K. T. S. Sarao. Delhi: Jayyed Press, 1995, pp. 3- 14. Singh, Mian Goverdhan. Festivals, Fairs and Customs of Himachal Pradesh. New Delhi: Indus Publishing Company, 1992. Singhal, D.P. Buddhism in East Asia. New Delhi, India: Books & Books, 1984. Somaratna, G. P. V. "Christian Impact on the Wesak Celebrations in Sri Lanka. " Asia Journal of Theology Vol. 10, Number 1, April 1, 1996: pp. 3- 19. Spiro, E. Melford. Buddhism and Society: A Great Tradition and its Burmese Vicissitudes. 2nd ed. Berkeley and Los Angeles: University of California Press, 1982. Subhuti, Dharmachari (Alex Kennedy). Bringing Buddhism to the West: A Life of Sangharaks'hita. Birmingham, U.K.: Windhorse Publications, 1995. Sugunasiri, Suwanda, 1989. "Buddhism in Metropolitan Toronto: A Preliminary Overview." Journal of Canadian Ethnic Studies XXI (2): 83-103. Swearer, Donald. Wat Haripunjaya: A Study of the Royal Temple of the Buddha's Relic, Lamphun, Thailand. Missoula, Mont. : Scholars Press, 1976, pp. 43- 46. Swearer, Donald. Buddhism and Society in Southeast Asia. Chambersburg, P A: Anima Publications, 1981. Tambiah, S.J. World Conquerer and World Renouncer: A Study of Buddhism and Polity in Thailand Against a Historical Background. Cambridge, Mass. : Cambridge University Press, 1976. Tanaka, K. Kenneth. "Epilogue: The Colors and Contours of American Buddhism". In The Faces of American Buddhism. Ed. Charles S. Prebish and Kenneth K. Tanaka. Berkeley: University of California, 1998, pp. 287-298. Thomas, Edward J. The Life of Buddha as Legend and History. 3 rd ed. London: Routledge and Kegan Paul Ltd., 1949. Thomas, P. Festivals and Holidays of India. India: D.B. Taraporevala Sons & Co. Private Ltd. 1971. Toronto Sun. "Buddha's Birthday". Monday May 11, 1981, sec. 3, p. 14. Tweed, Thomas A. The American Encounter with Buddhism 1814-1912: Victorian Culture and the Limits of Dissent. Indianapolis, Indiana: Indiana University Press, 1990. United Nations. Press Release. "International Recognition of the Day ofVesak". New York: United Nations, December 13,1999. Wells, Kenneth E. Thai Buddhism: Its Rites and Activities. Bangkok, Thailand: The Bangkok Times Press, Ltd. 1939.